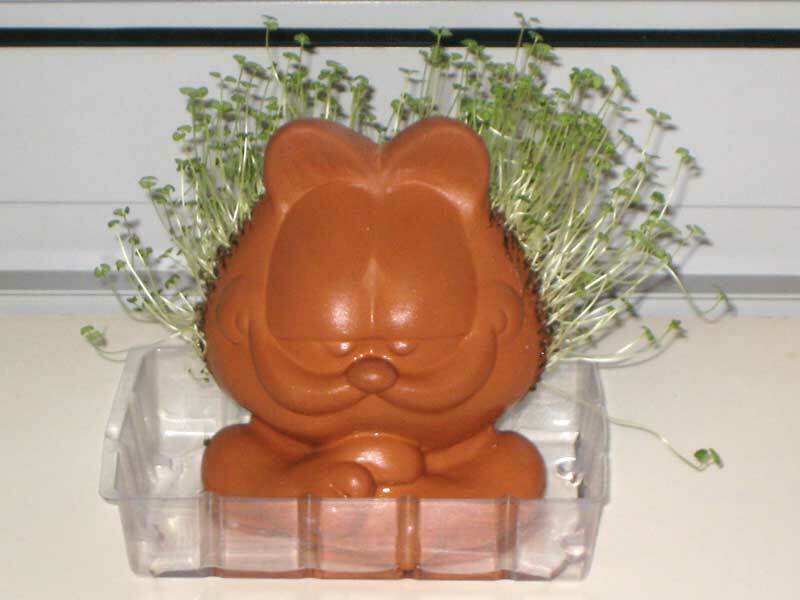 For the holidays, my mother got me a Chia Garfield as a gift. 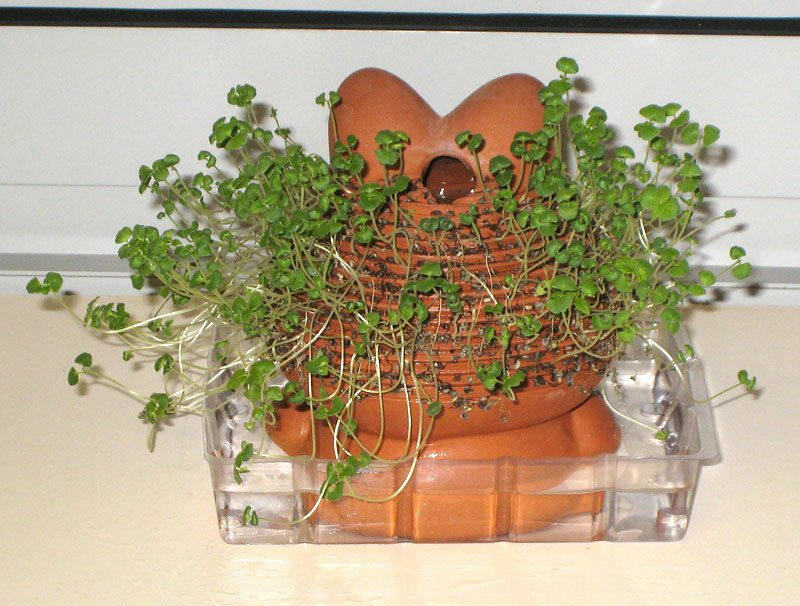 In early January 2009, I “planted” it. 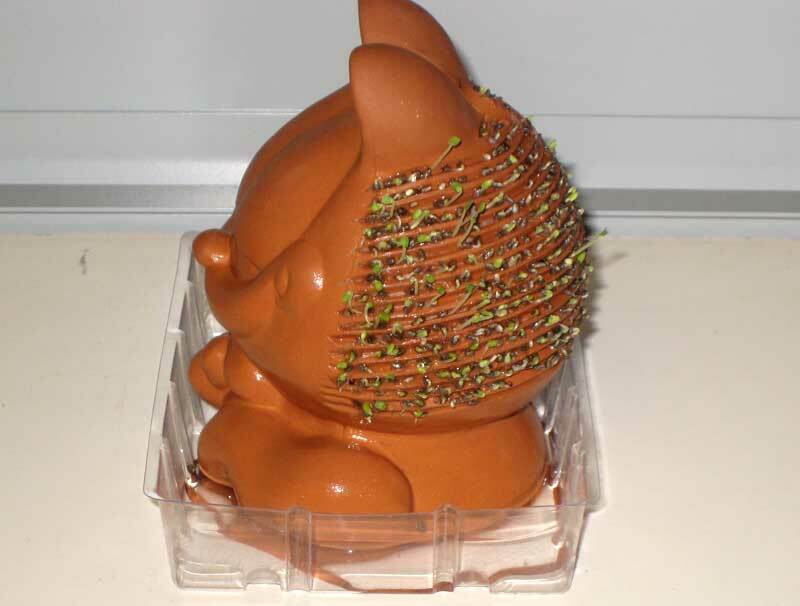 Just like the last time I planted a Chia Pet, I’m going to document this one. 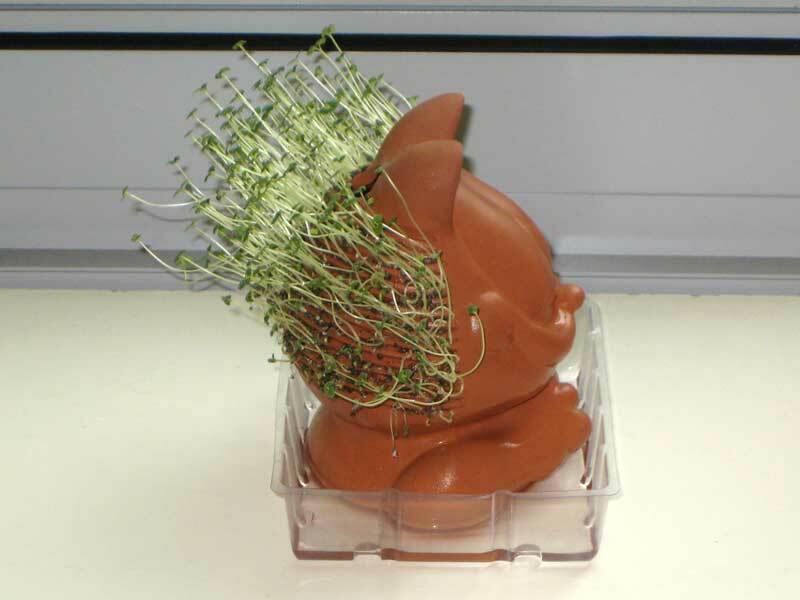 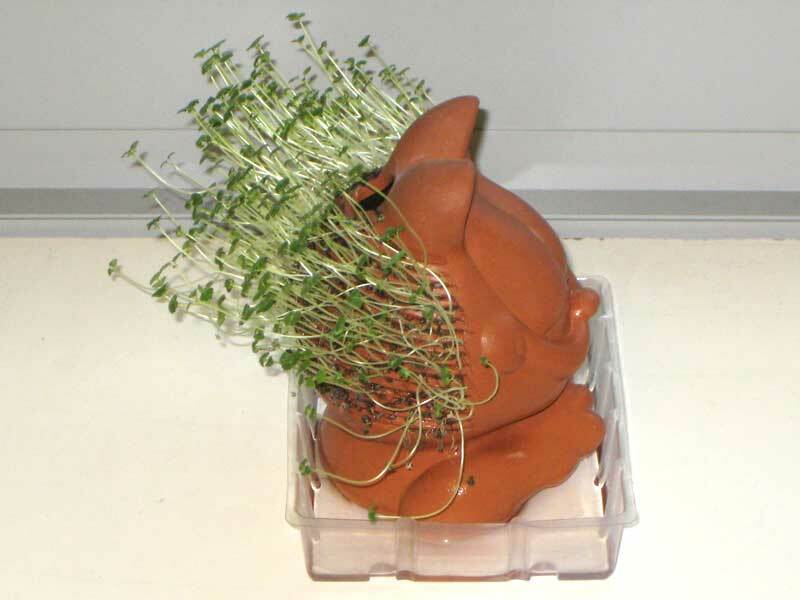 Joseph Enterprises, the makers of the Chia Pet family of products, include enough seeds for several plantings of the Chia Pet. 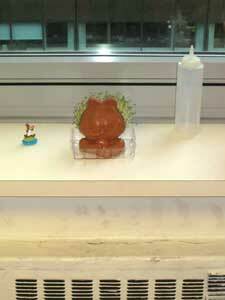 For the first planting, I decided that it should take place in my office, so my co-workers could enjoy it. 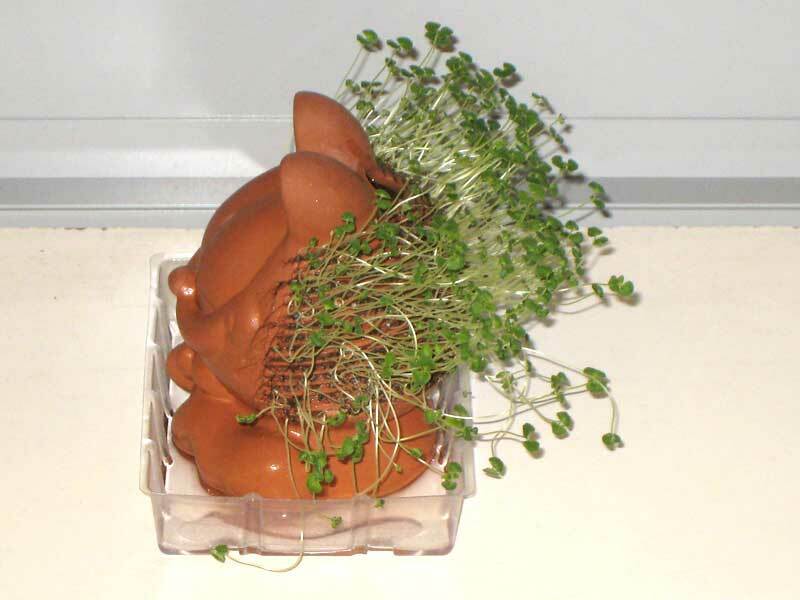 There are certain limitations that the office environment introduces. 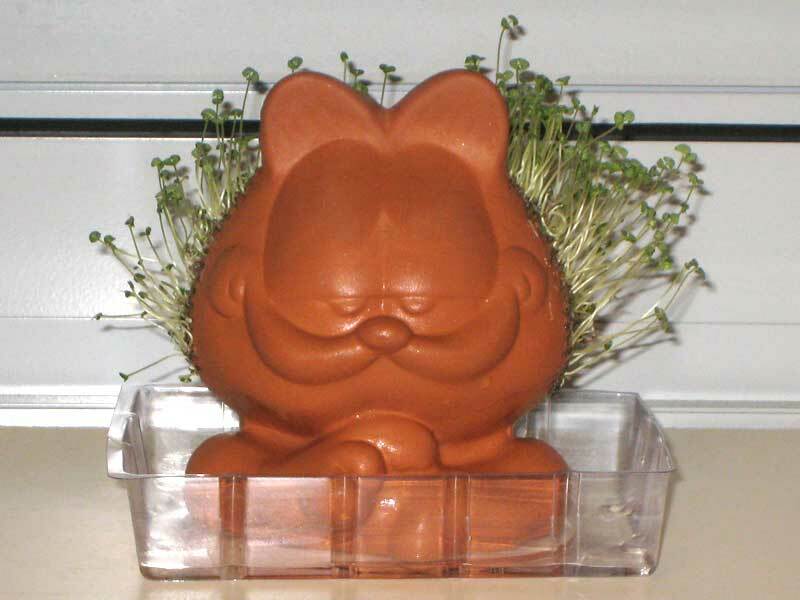 For starters, I’m not there on the weekends to keep it watered, including the three-day weekend for Martin Luther King, Jr.’s birthday. 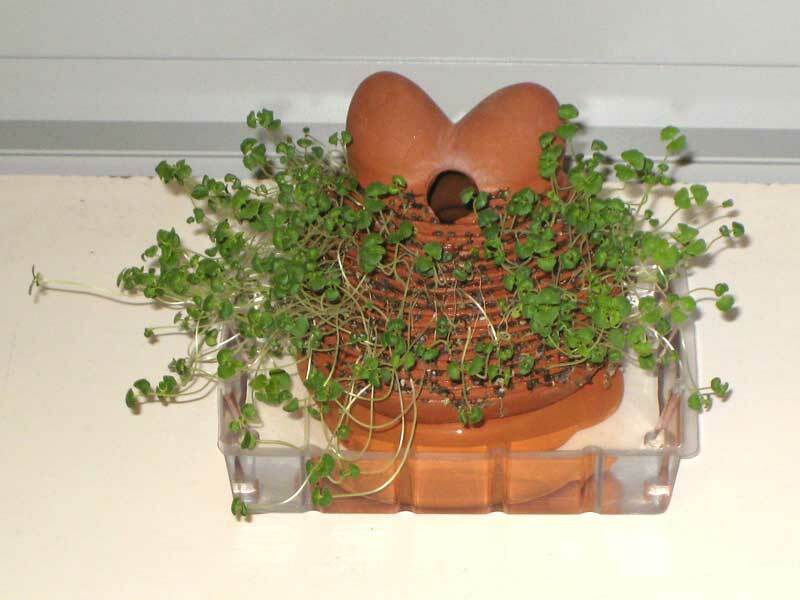 Second, the heat is significantly reduced at night so the environment changes drastically within a 24 hour period. 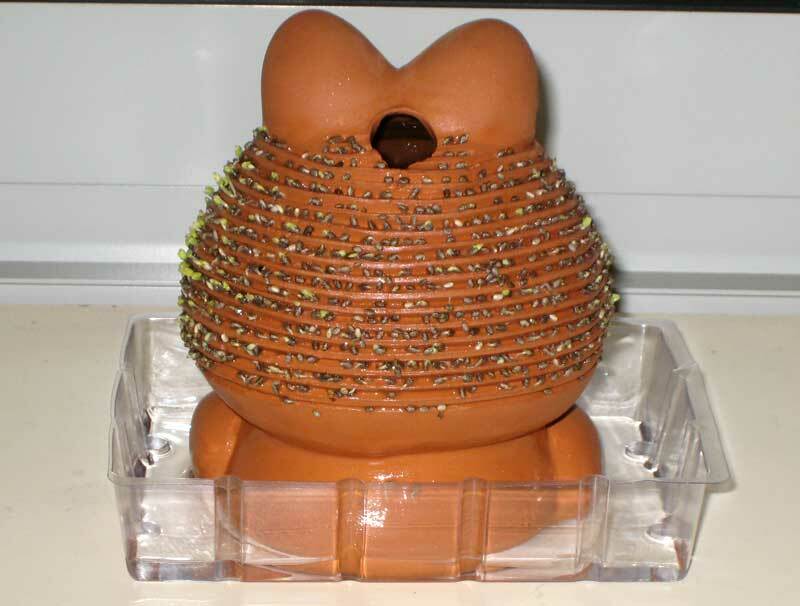 Even with these limitations, I’m going forward with the planting as is, just to see how it does. 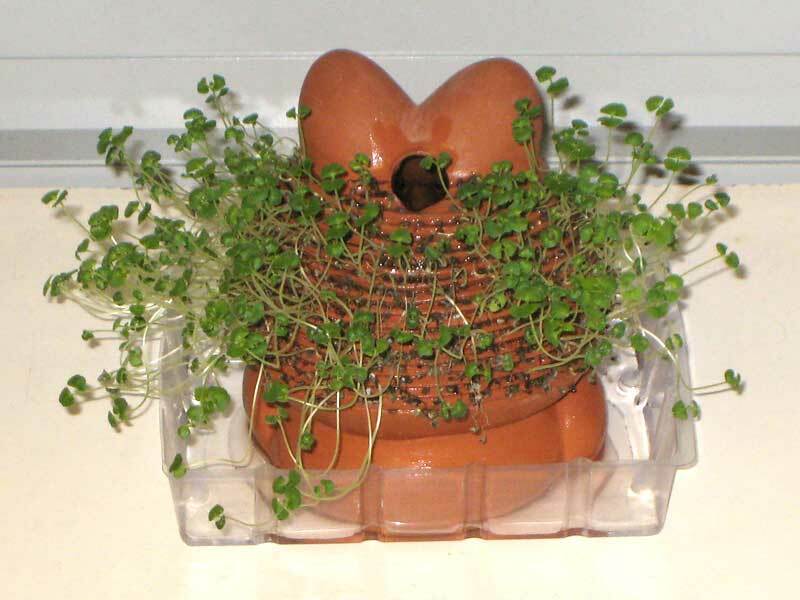 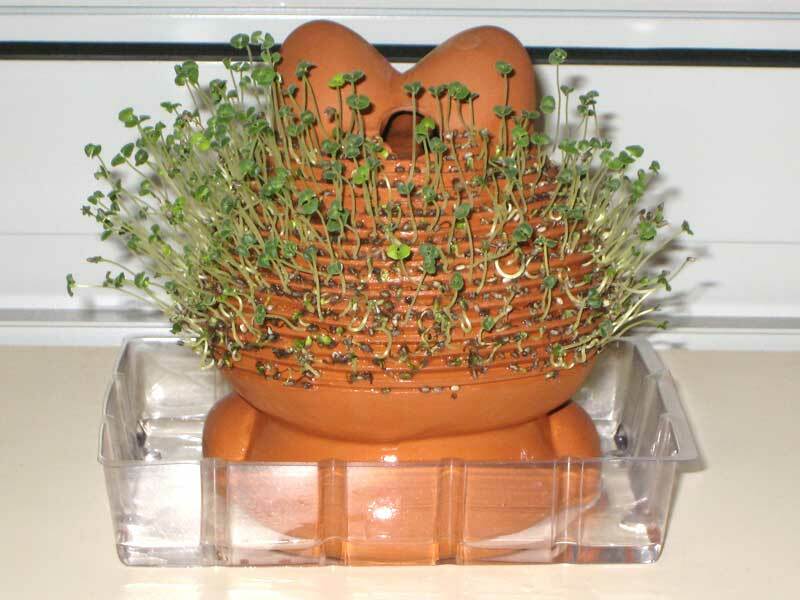 Because of my office location and view, there is more sunlight on the right side of the Chia Pet, so it would make sense that this side would sprout first, and will probably grow better. 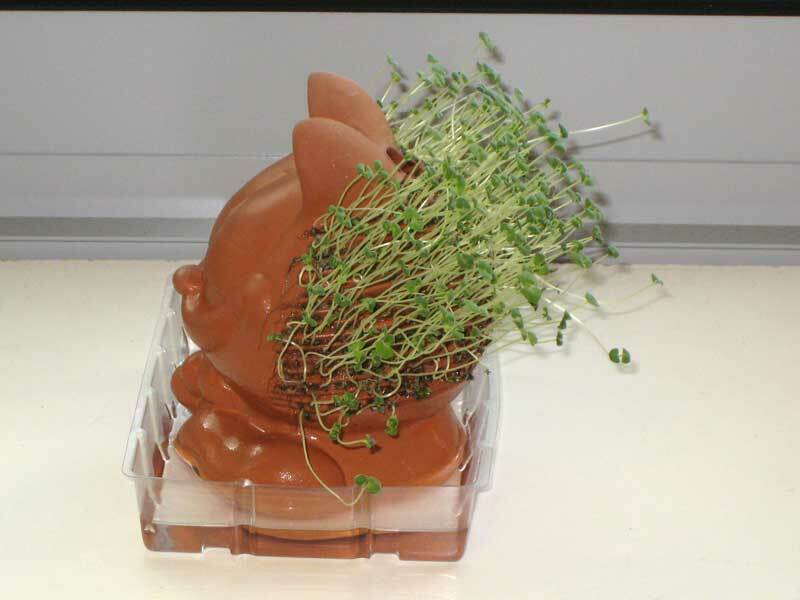 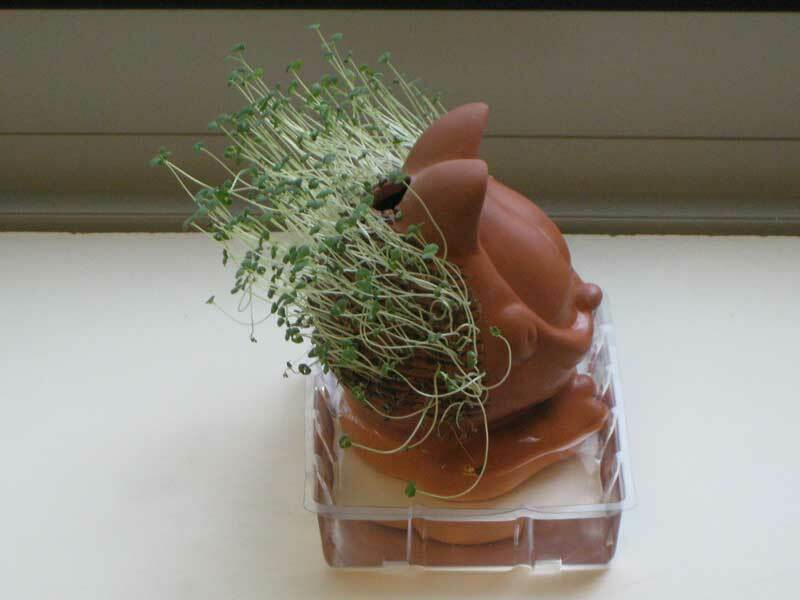 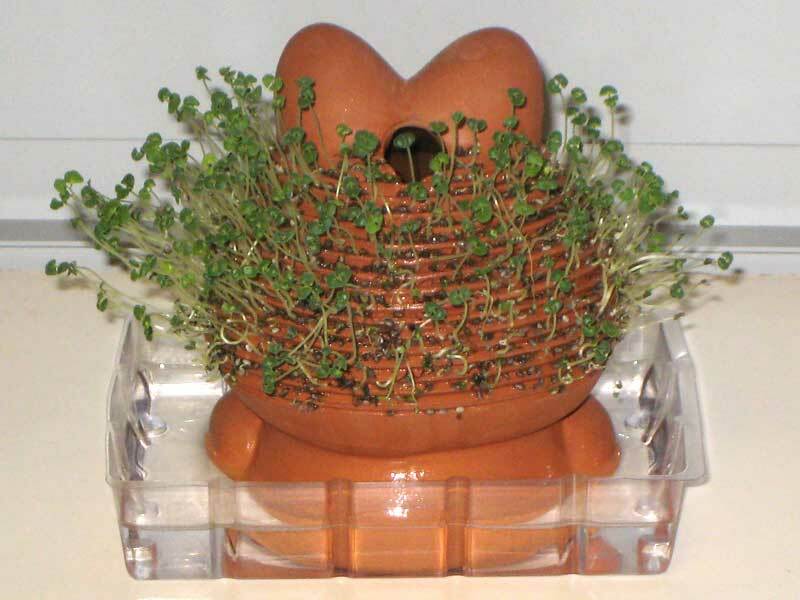 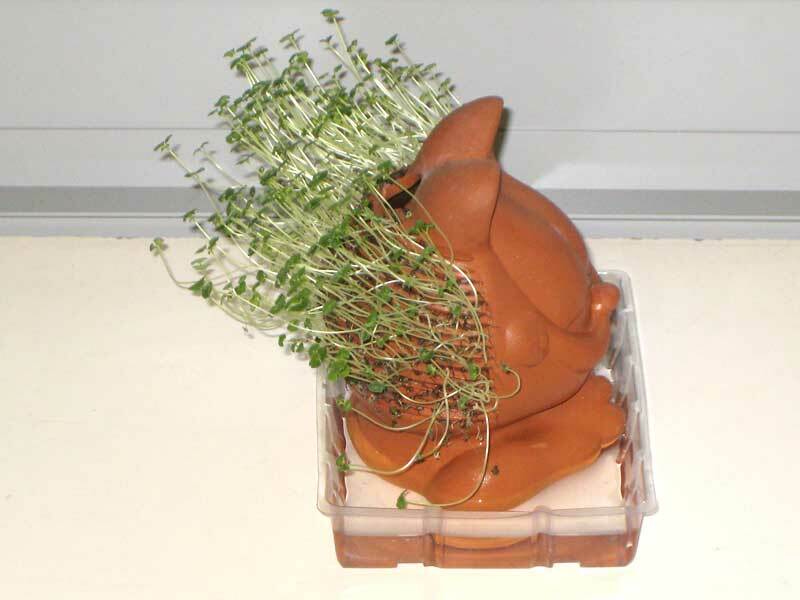 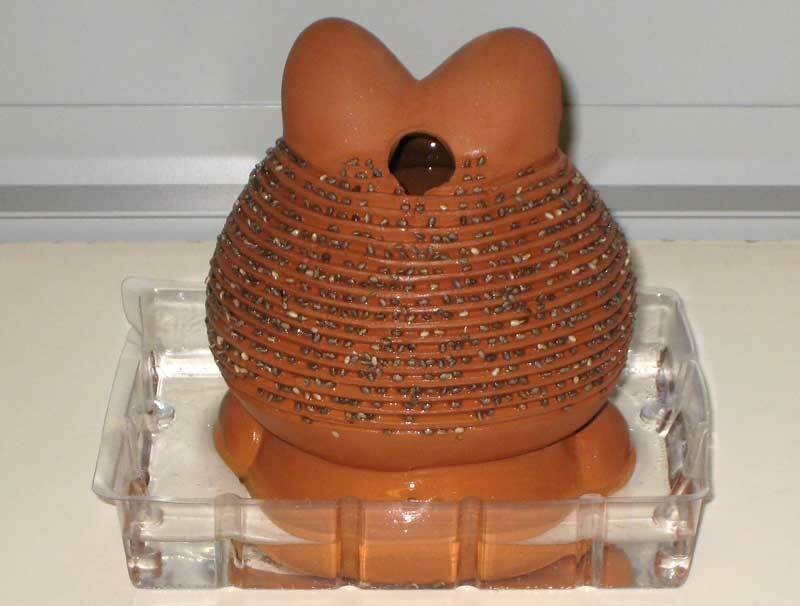 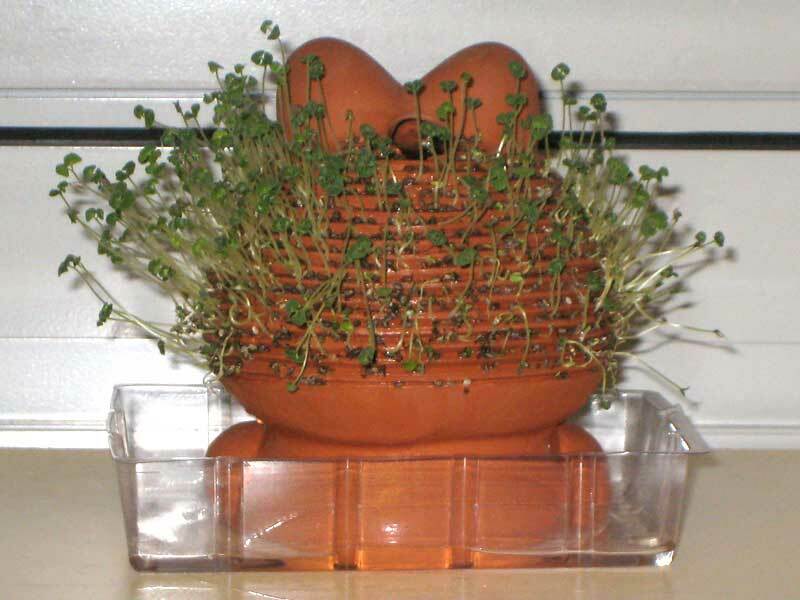 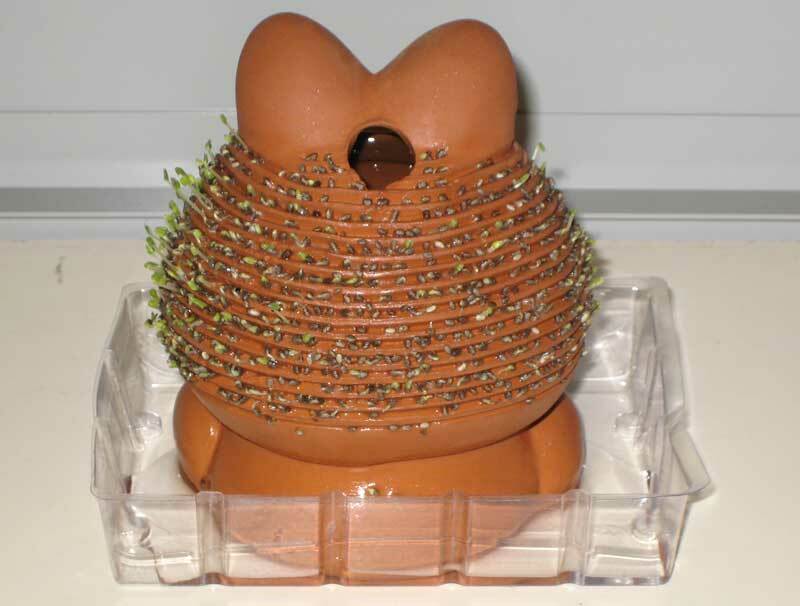 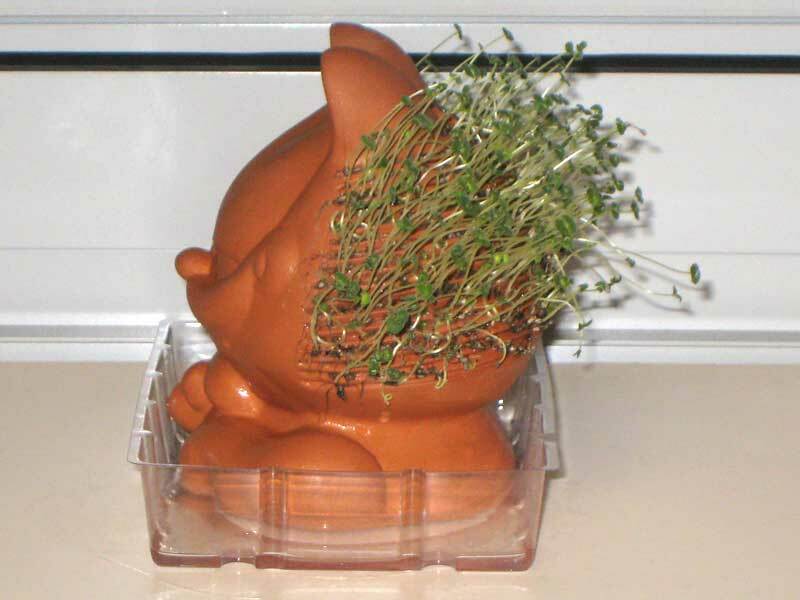 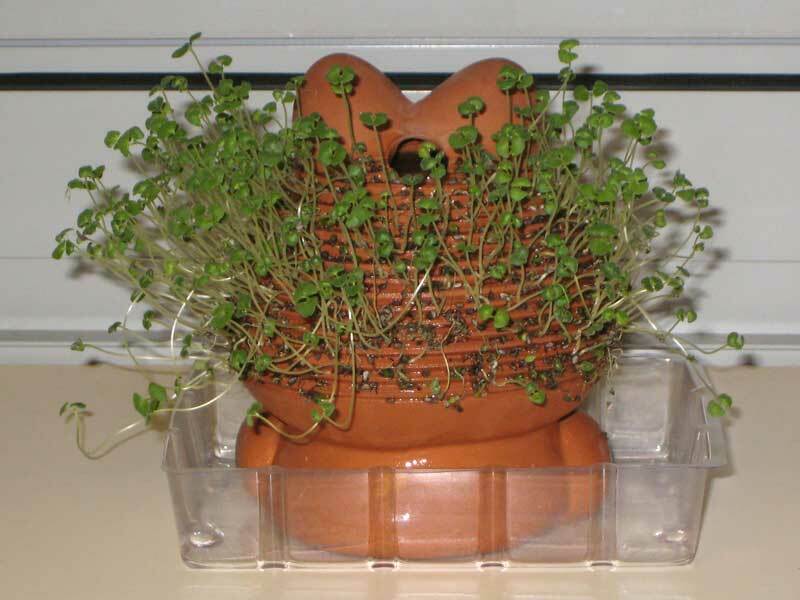 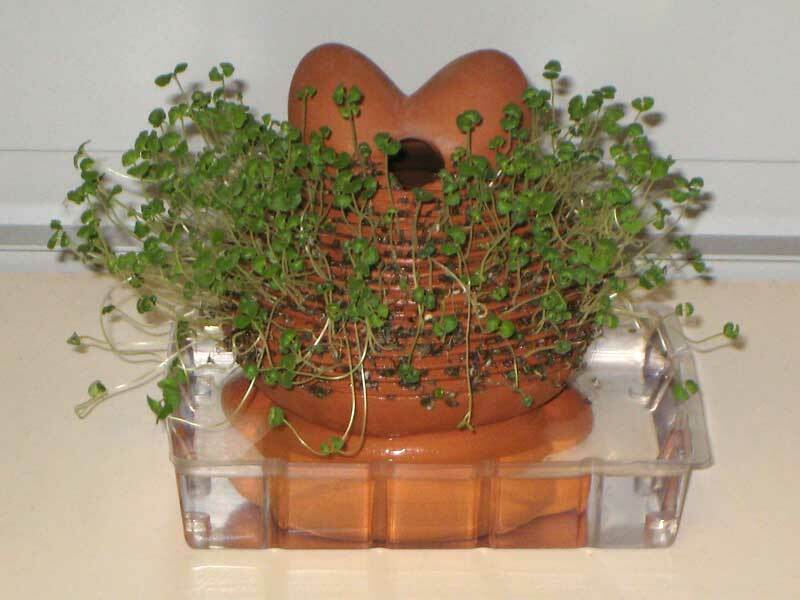 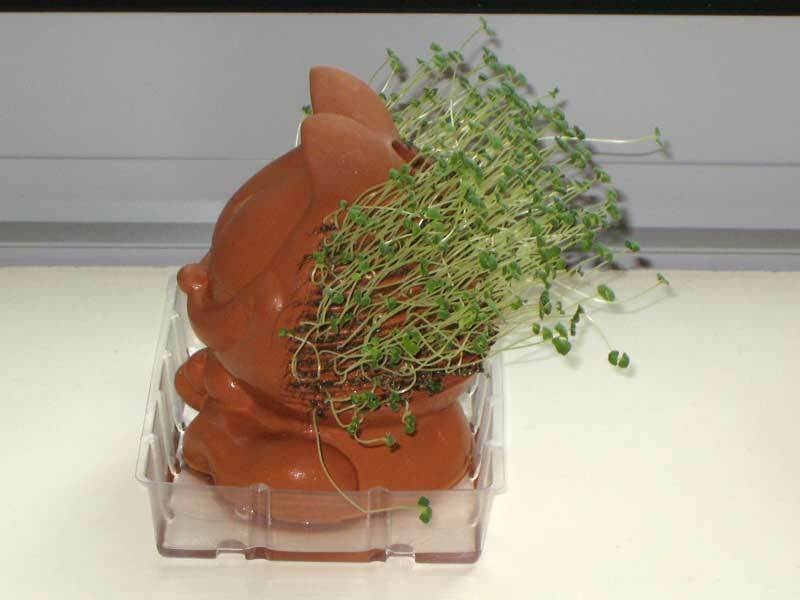 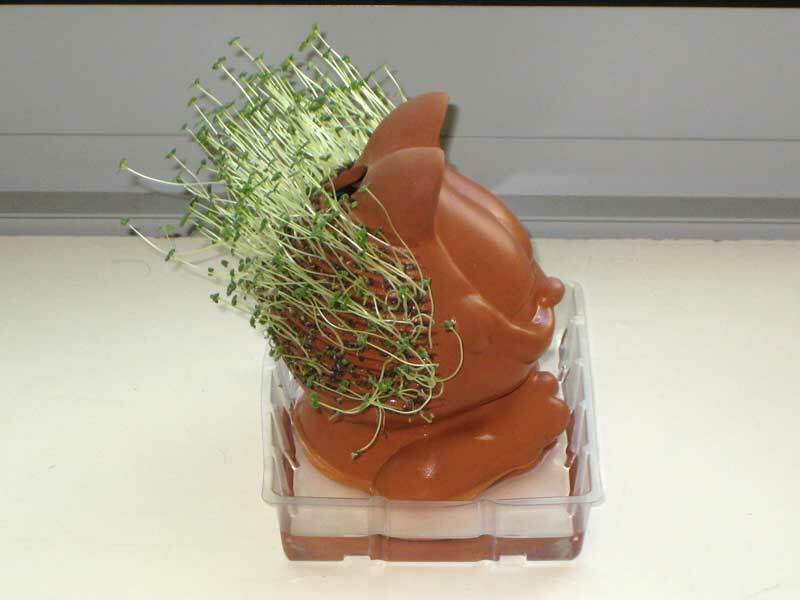 I won’t be rotating the Chia Pet to achieve optimum growth because I just want to see how it does unmanaged. 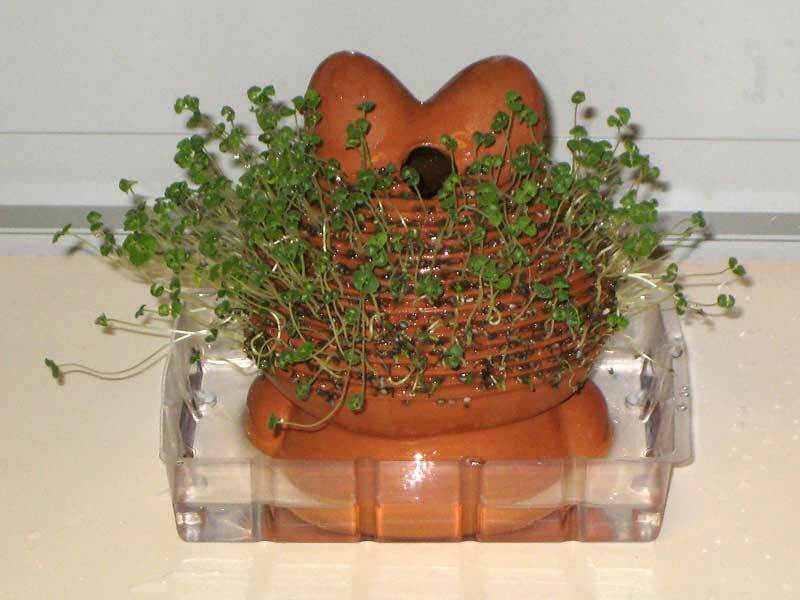 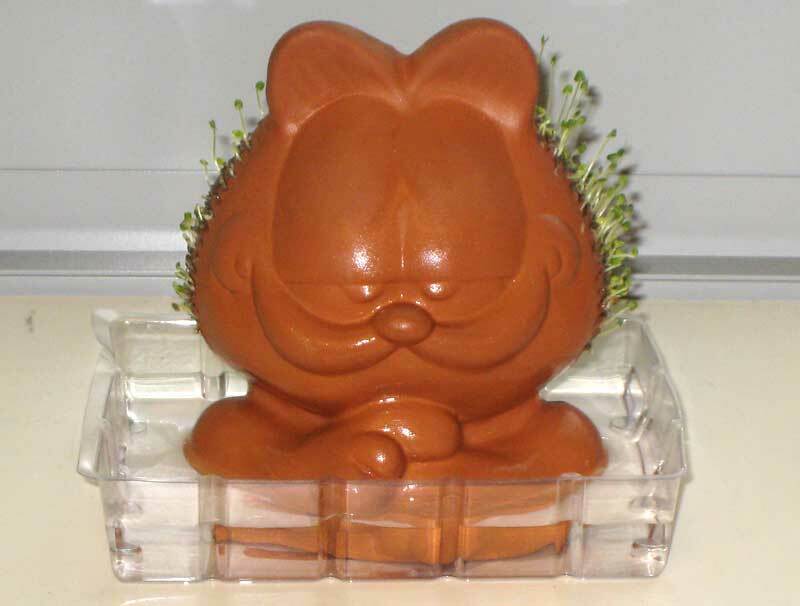 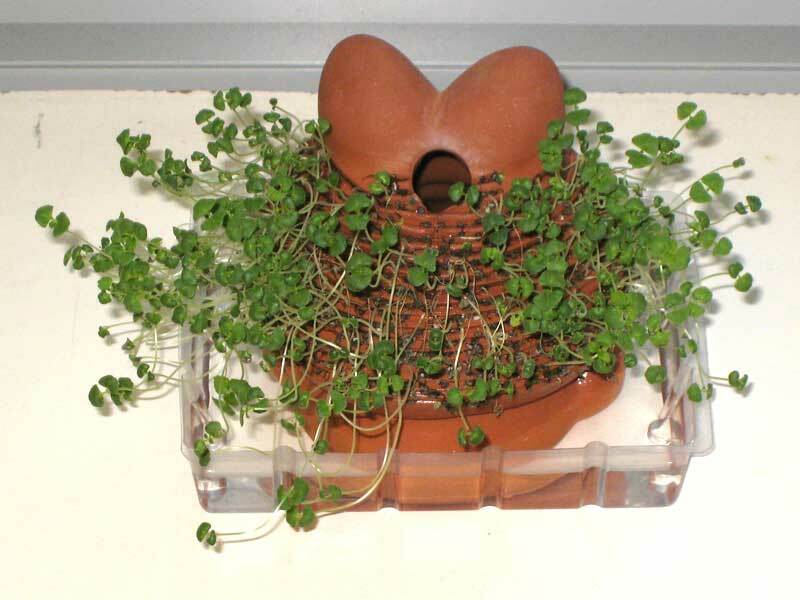 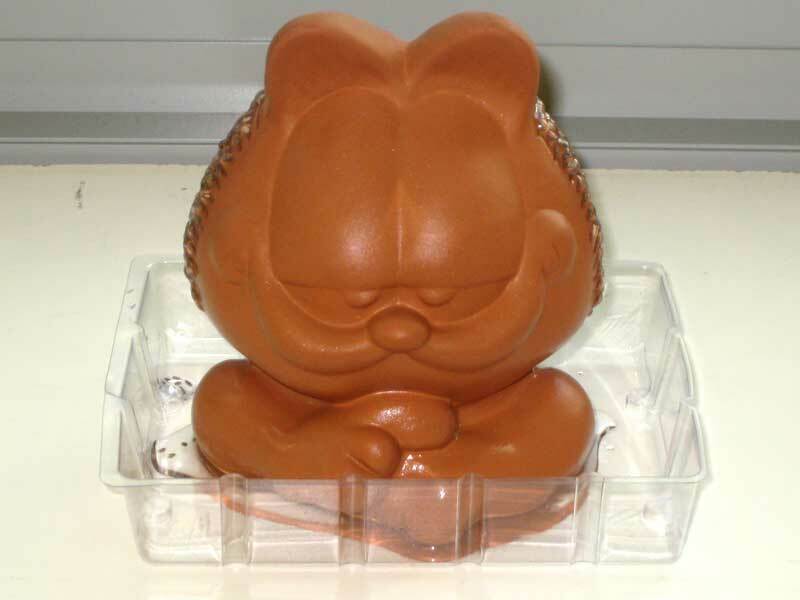 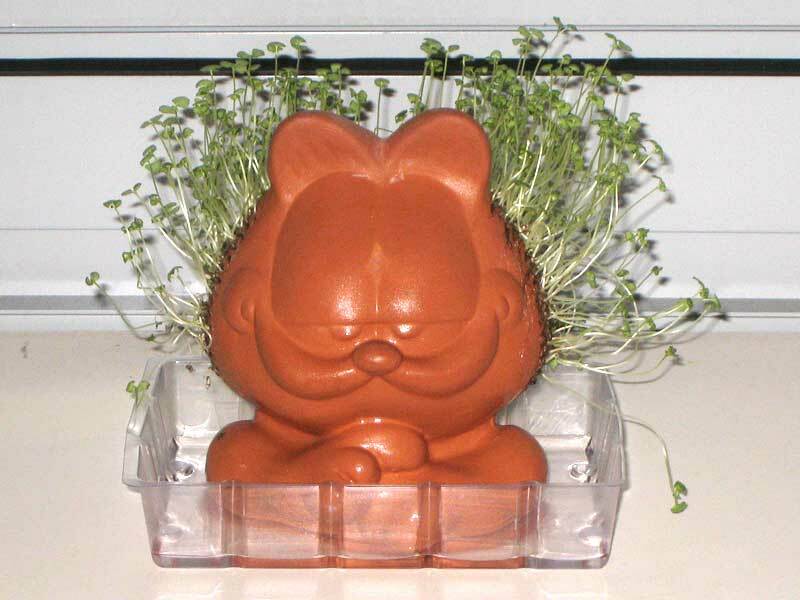 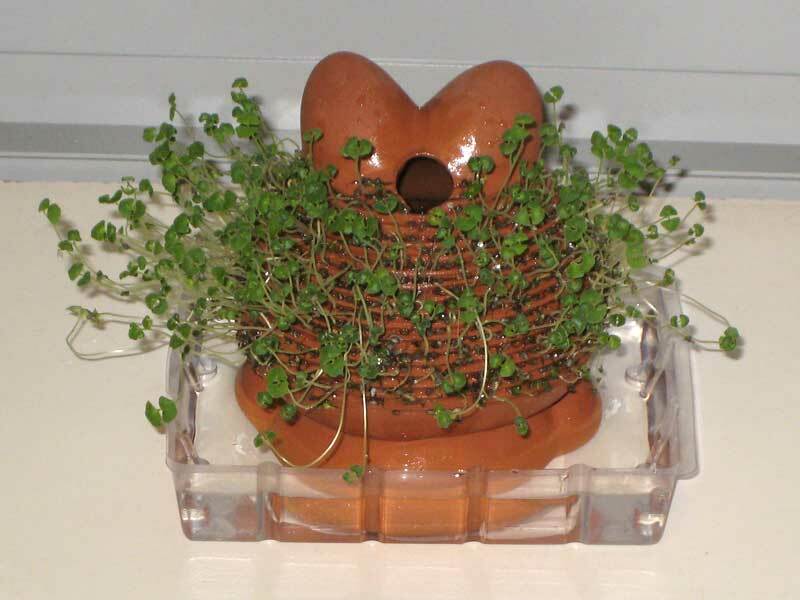 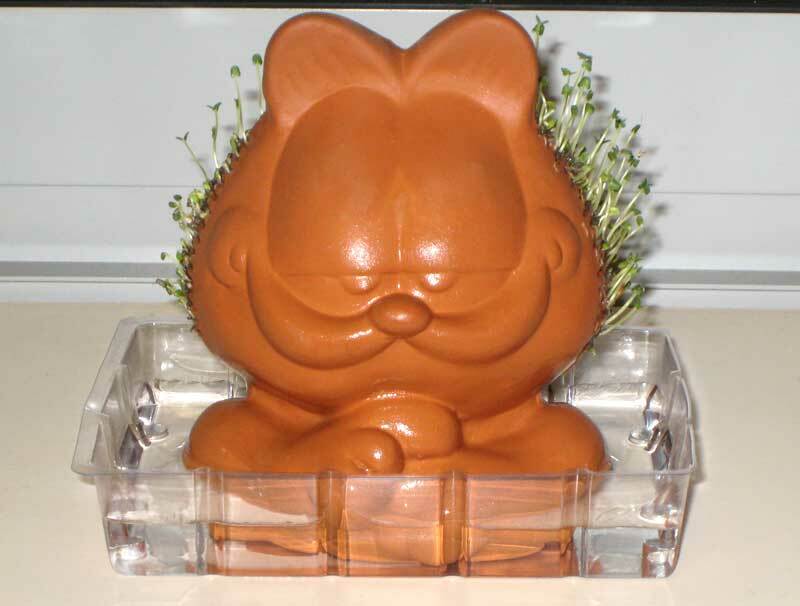 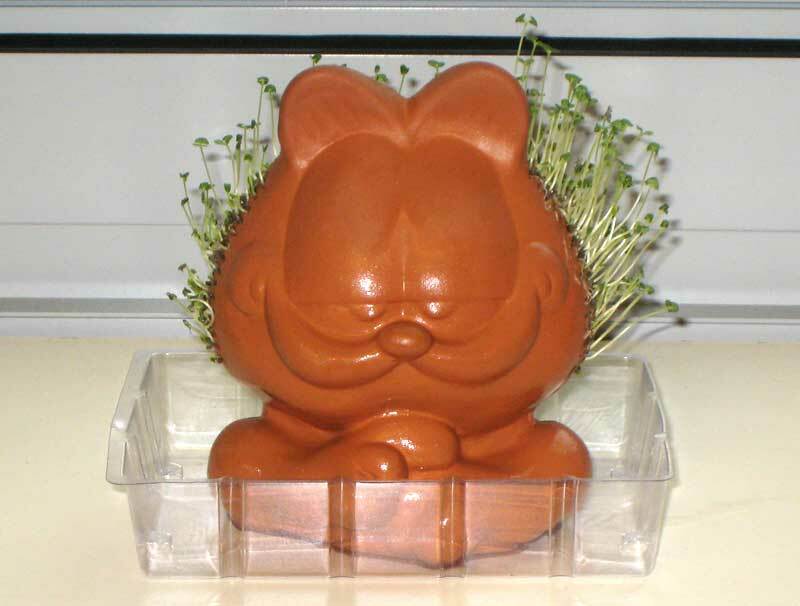 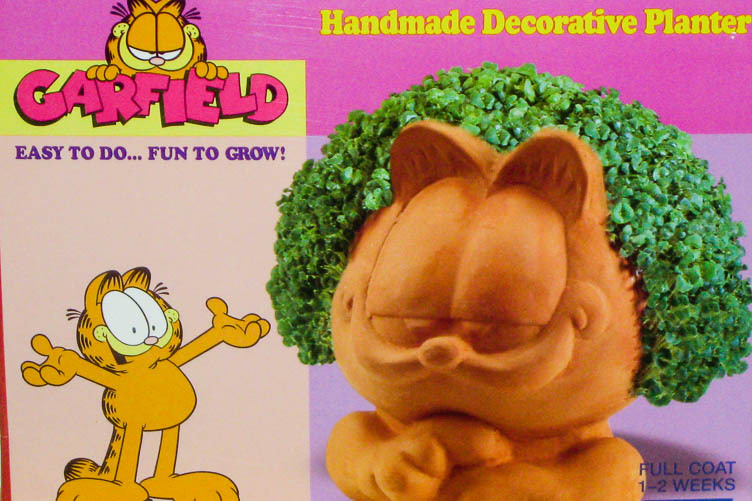 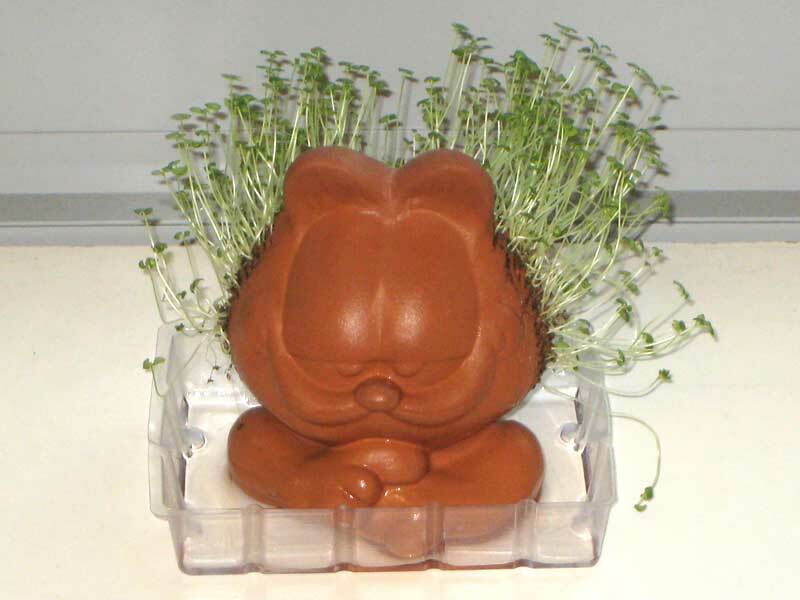 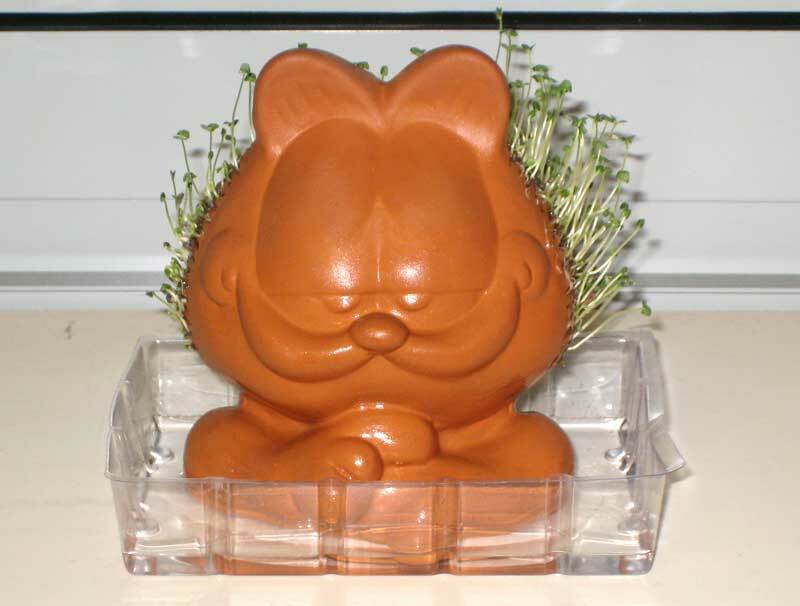 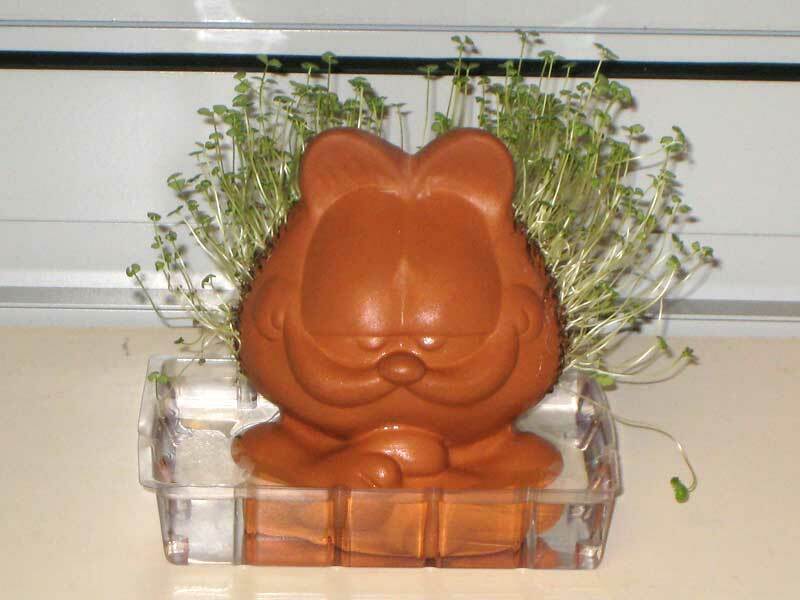 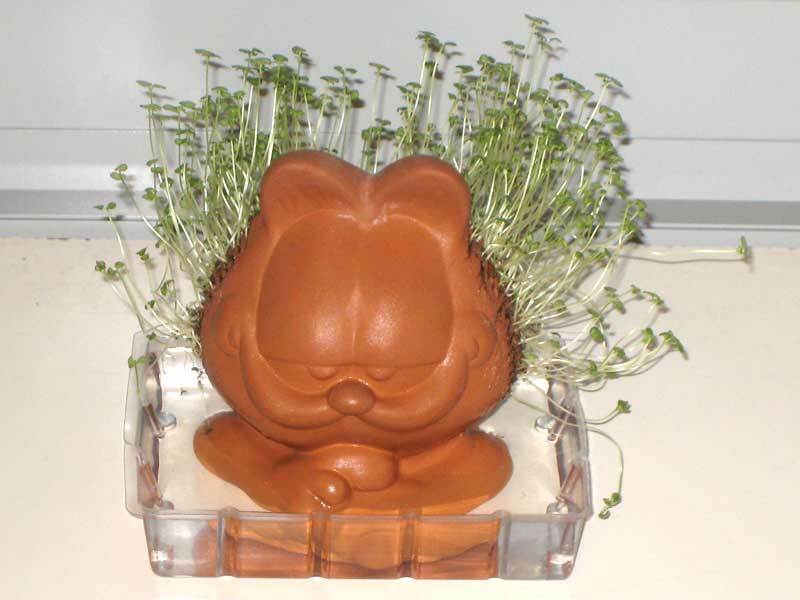 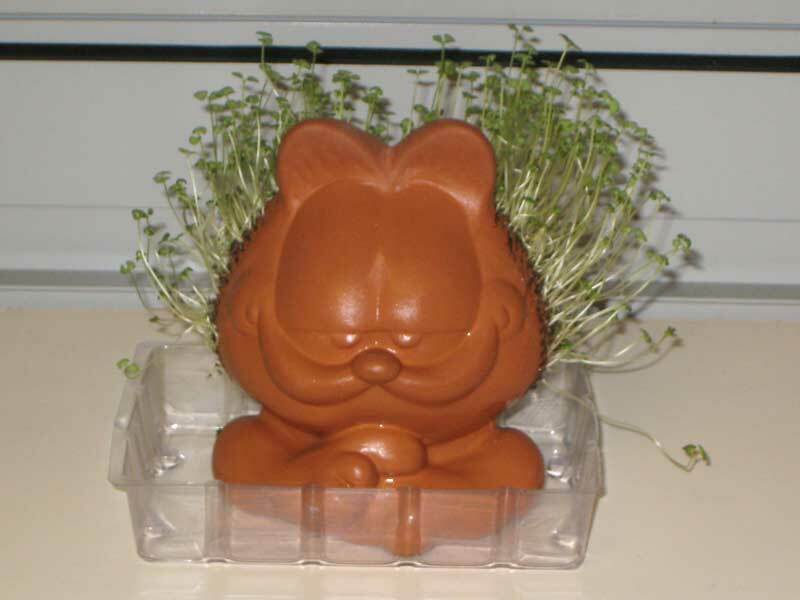 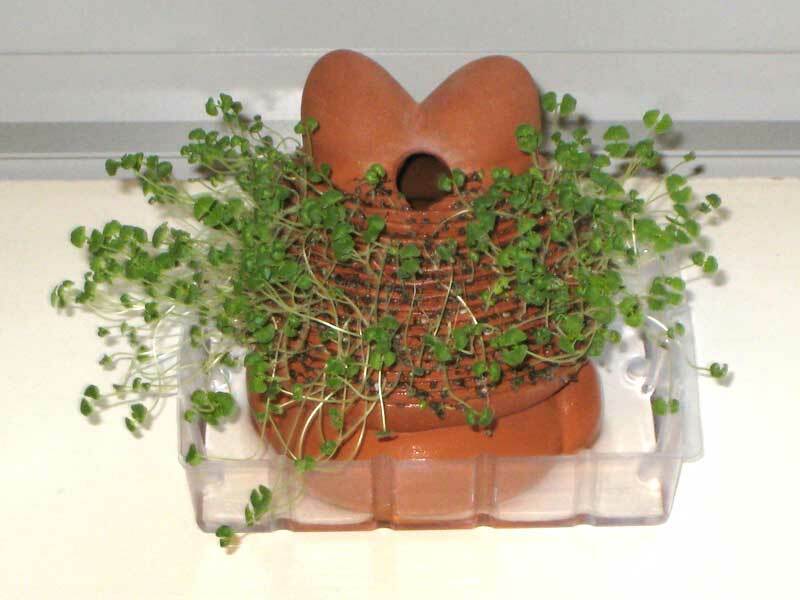 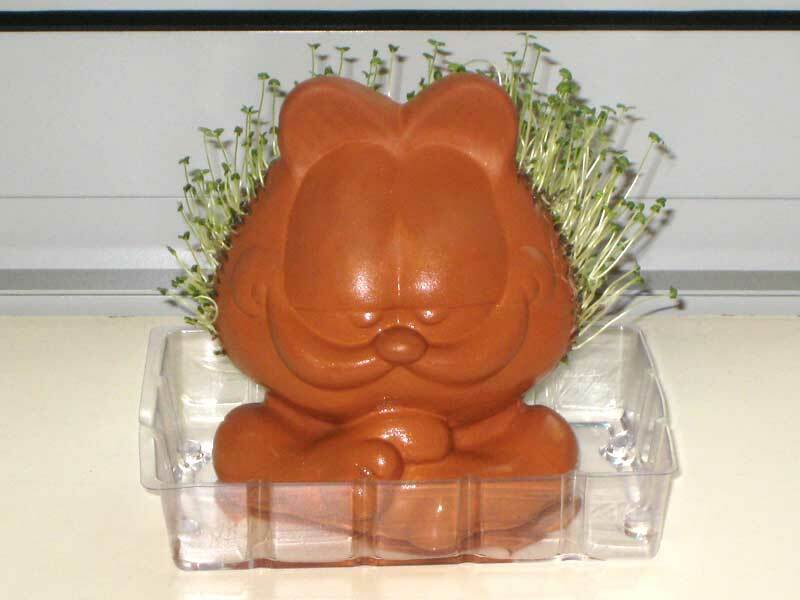 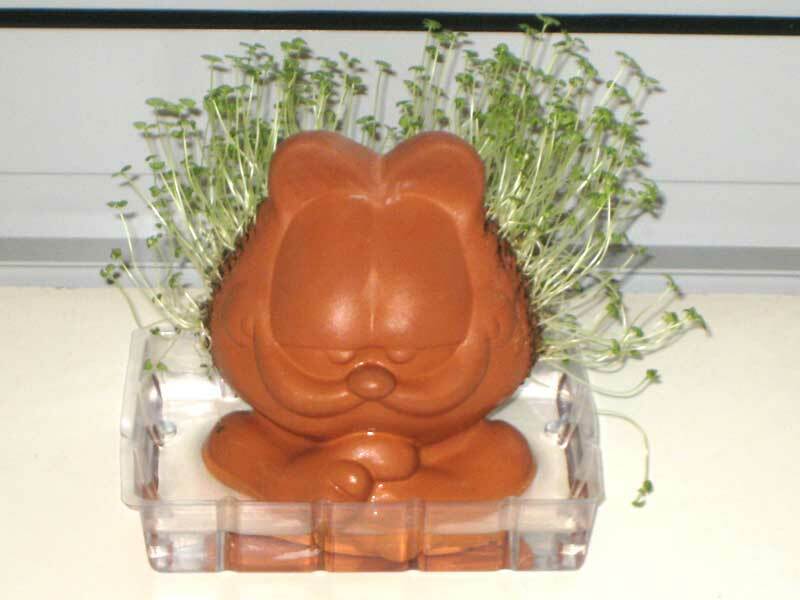 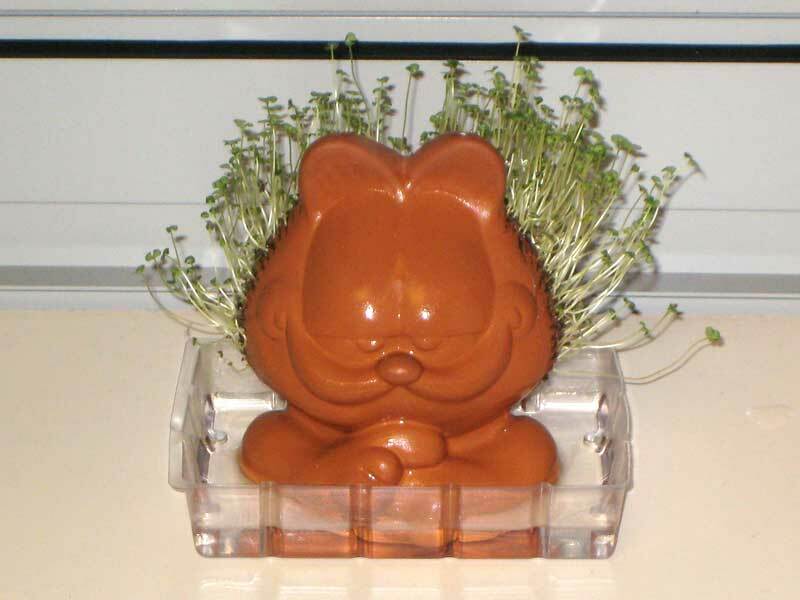 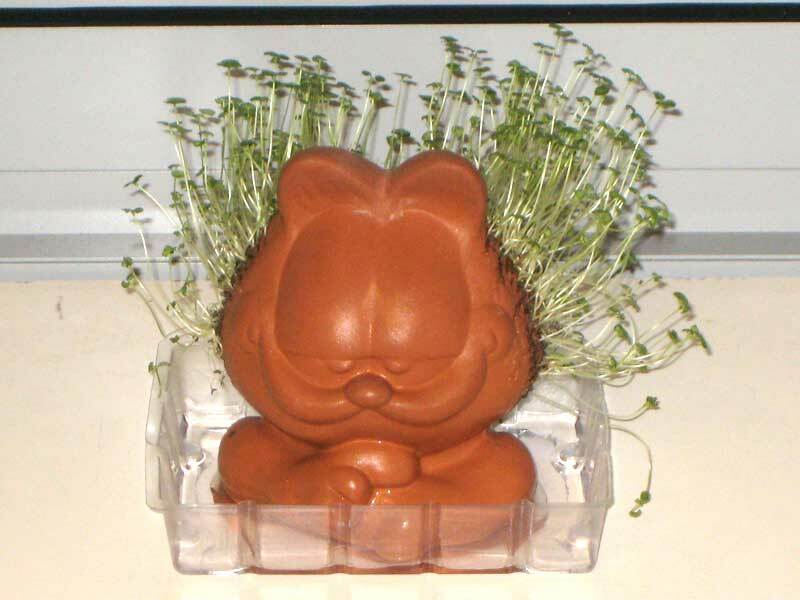 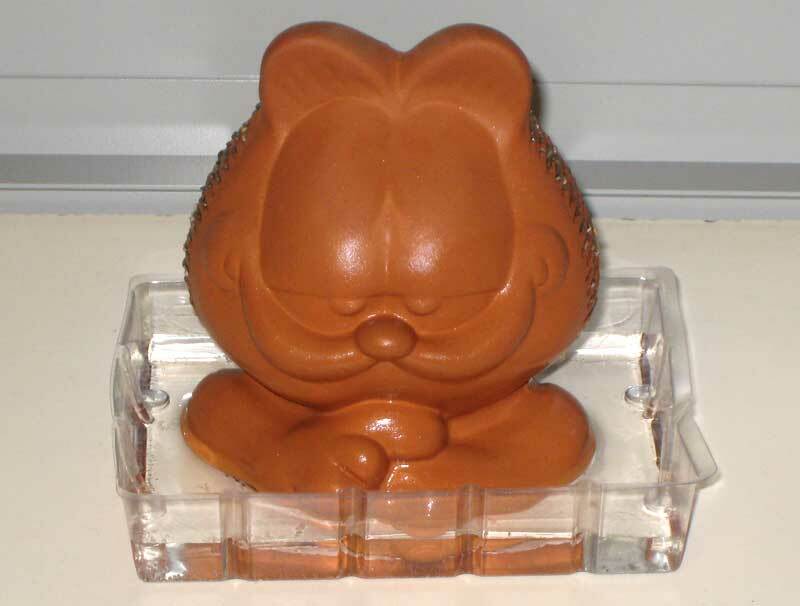 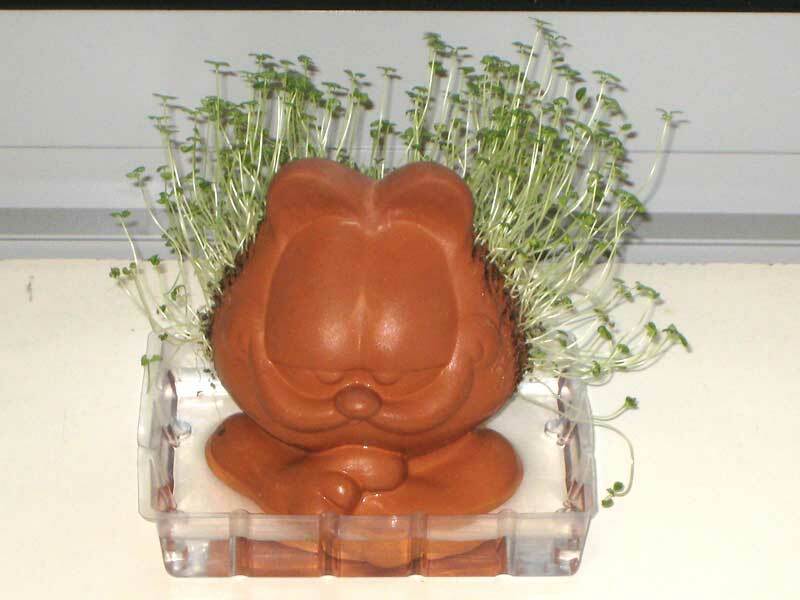 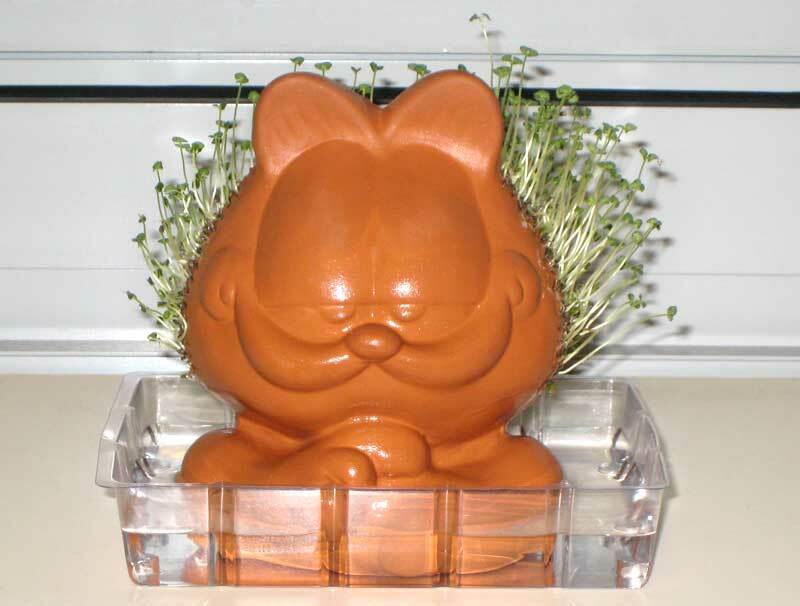 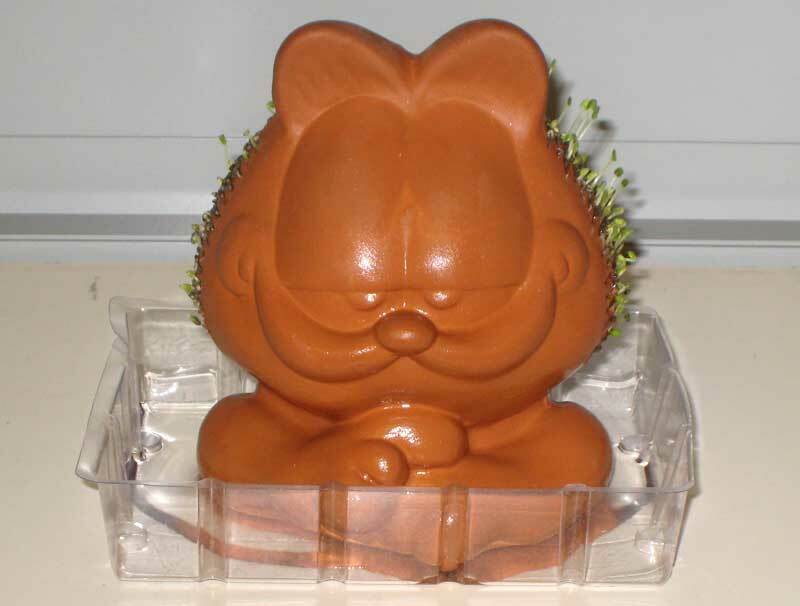 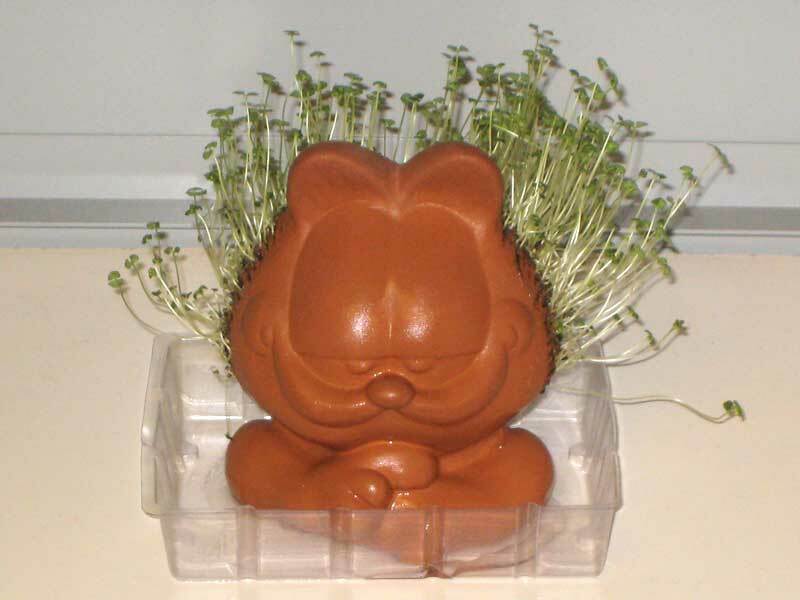 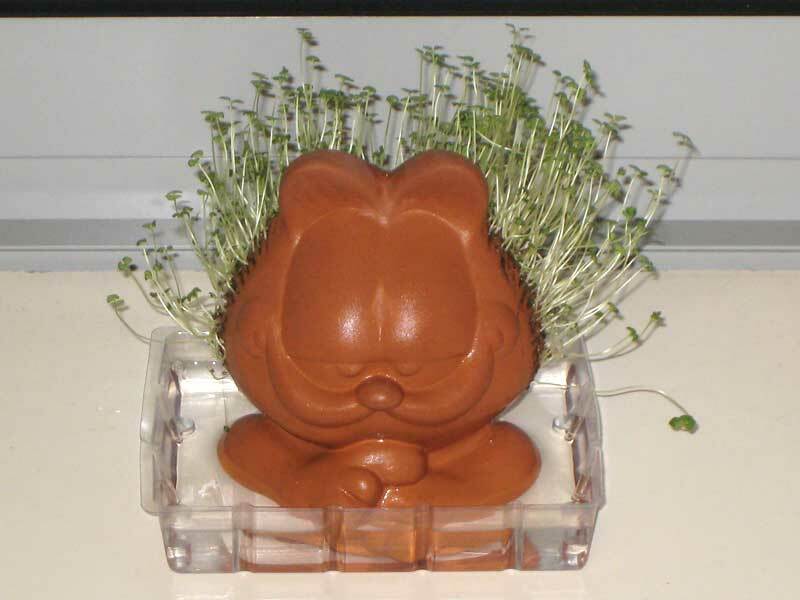 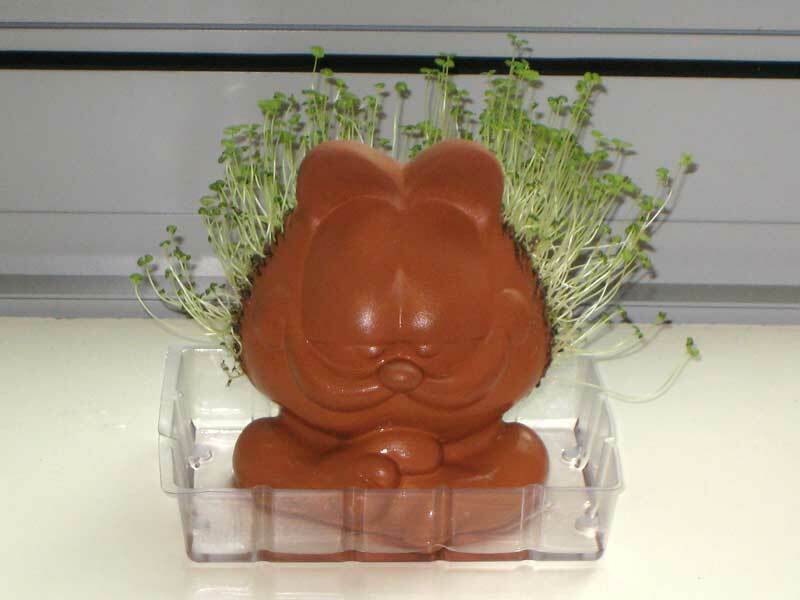 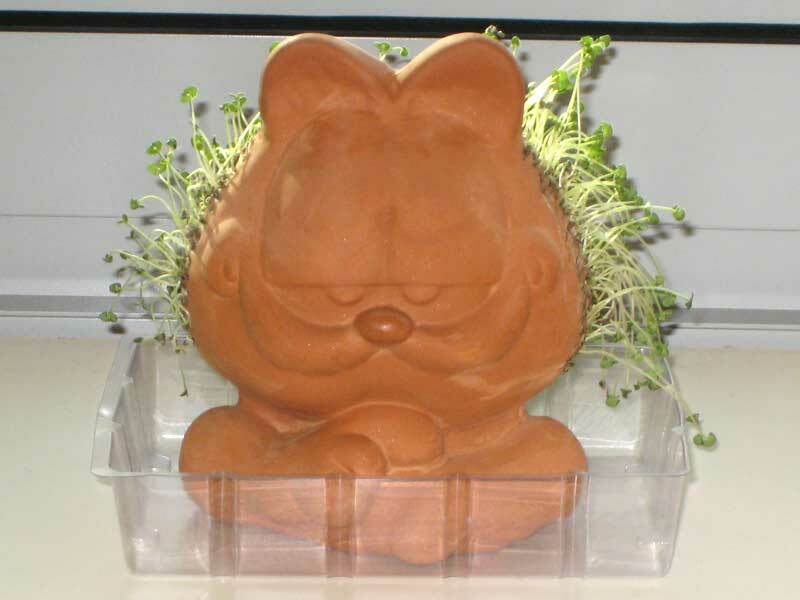 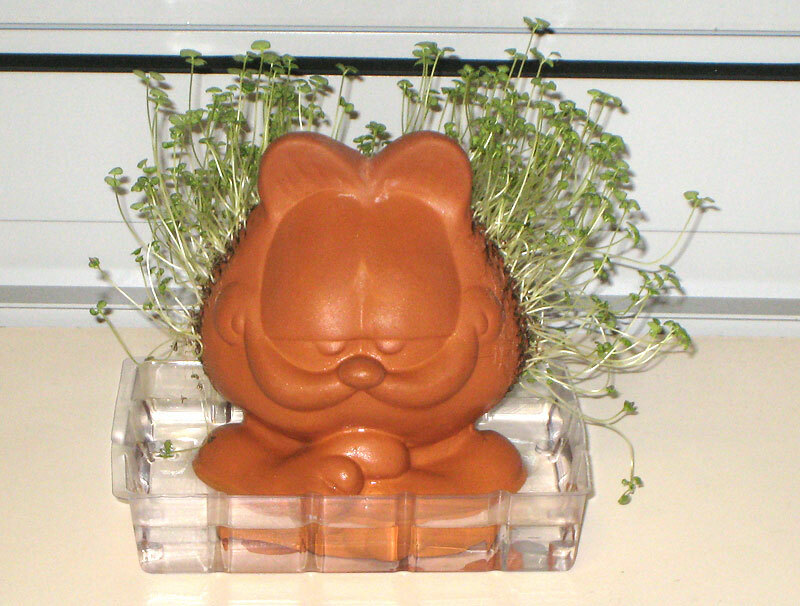 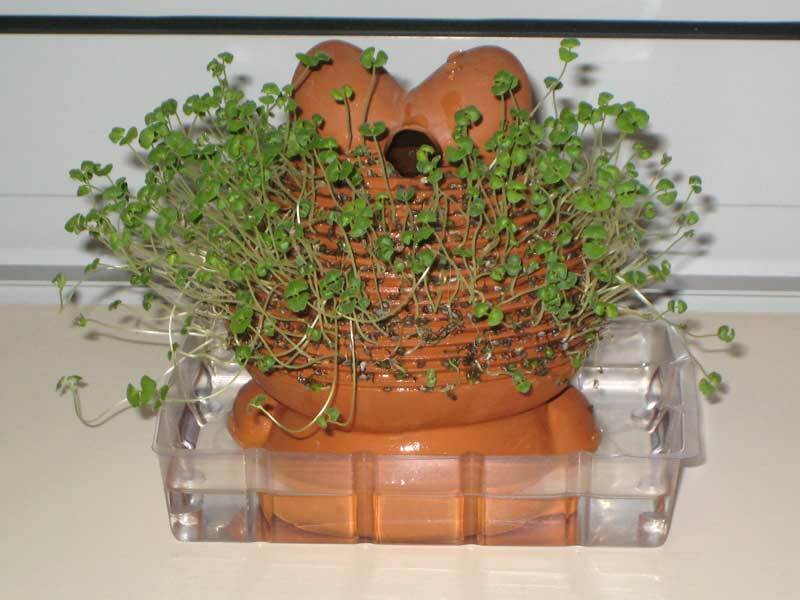 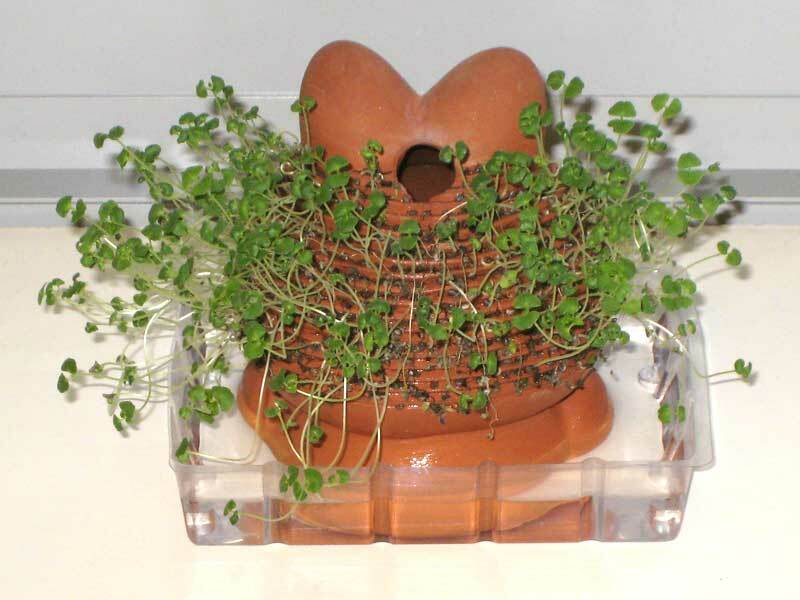 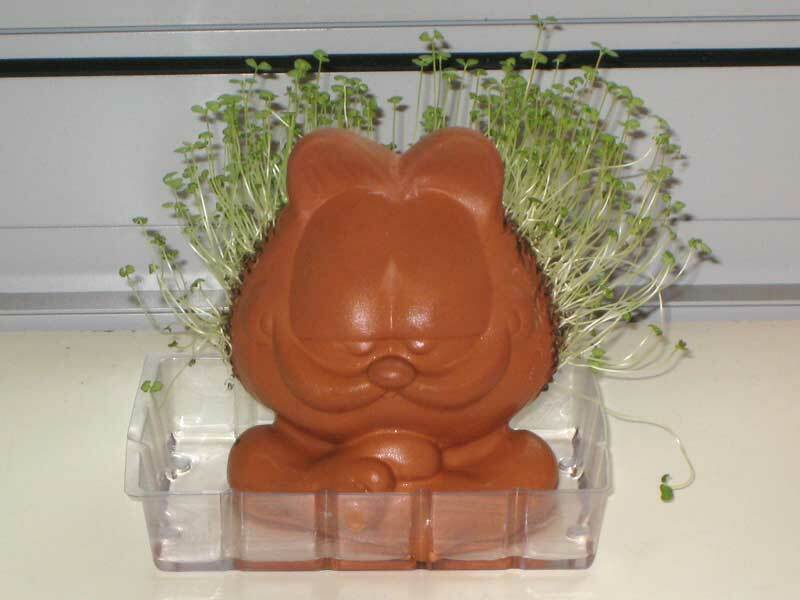 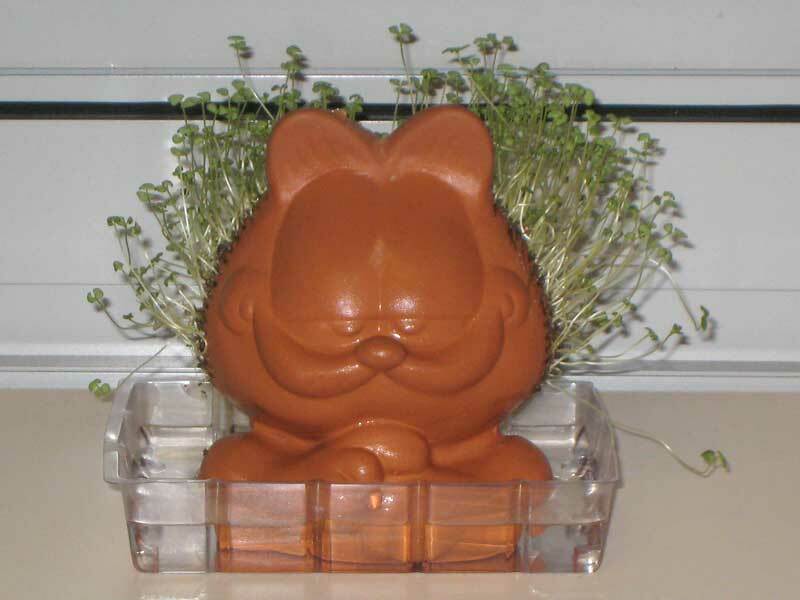 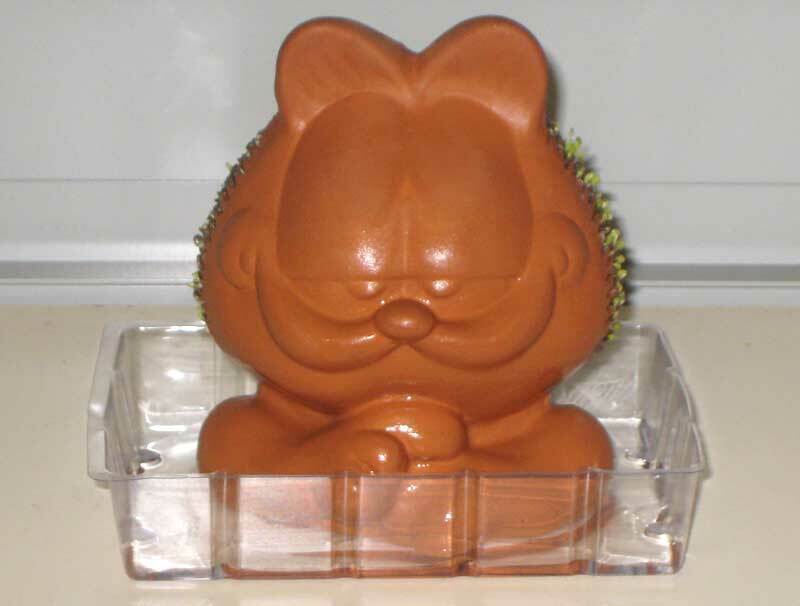 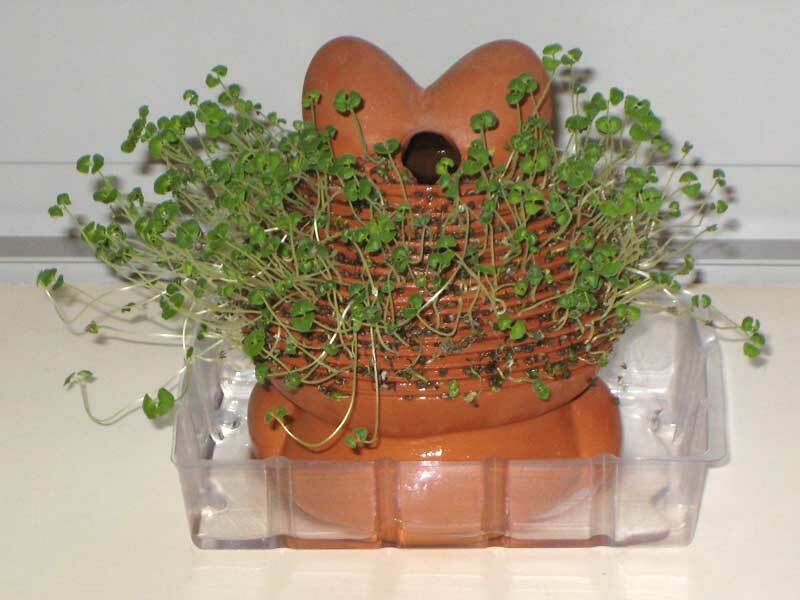 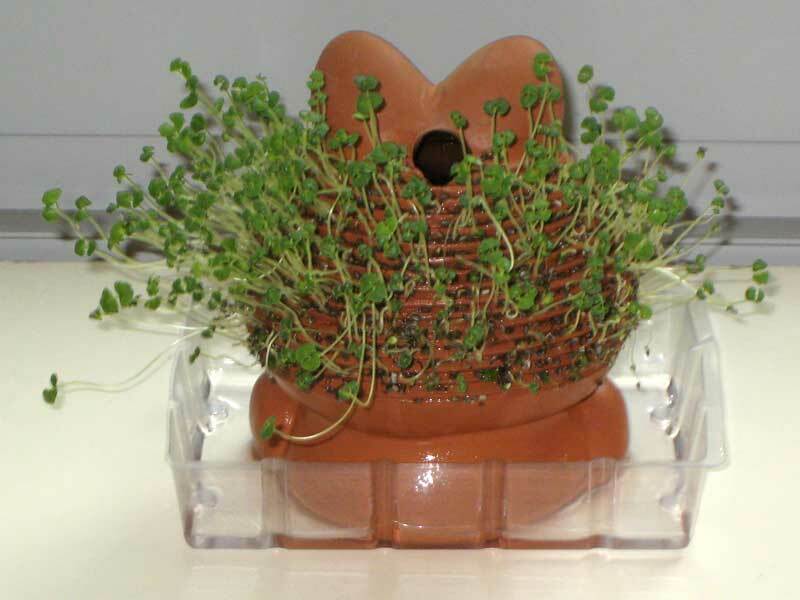 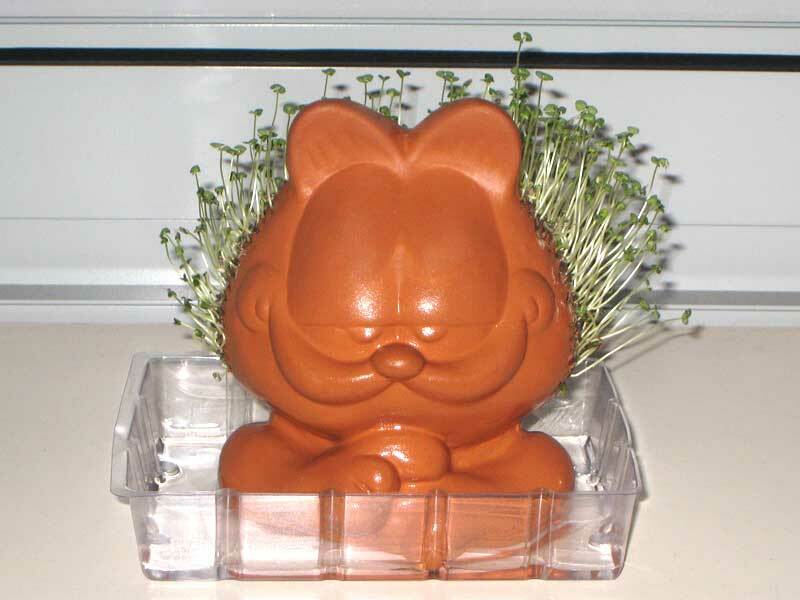 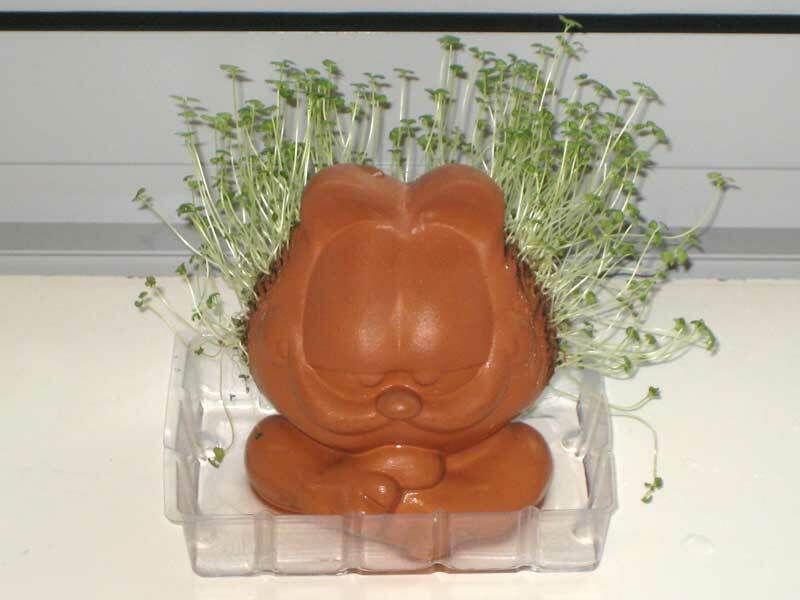 Because of it’s shape, the Chia Garfield is hollow throughout the pottery, which gives it a wide base and a lot of surface area that the water inside keeps moist. 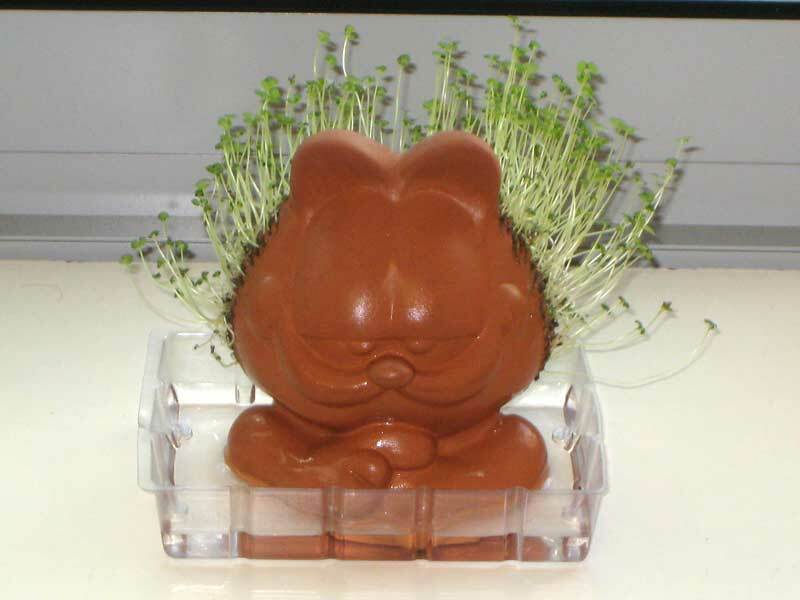 This, combined with other environmental factors in my office, means that the Chia Garfield looses a lot more water compared to the Chia cow that was previously planted. 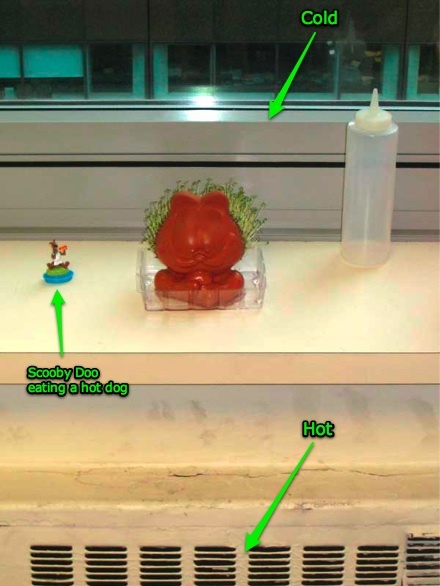 The drip tray needed to be emptied at least once every other day, but should have be done once a day unless I wanted to spill water on the floor as I carried it to the sink. 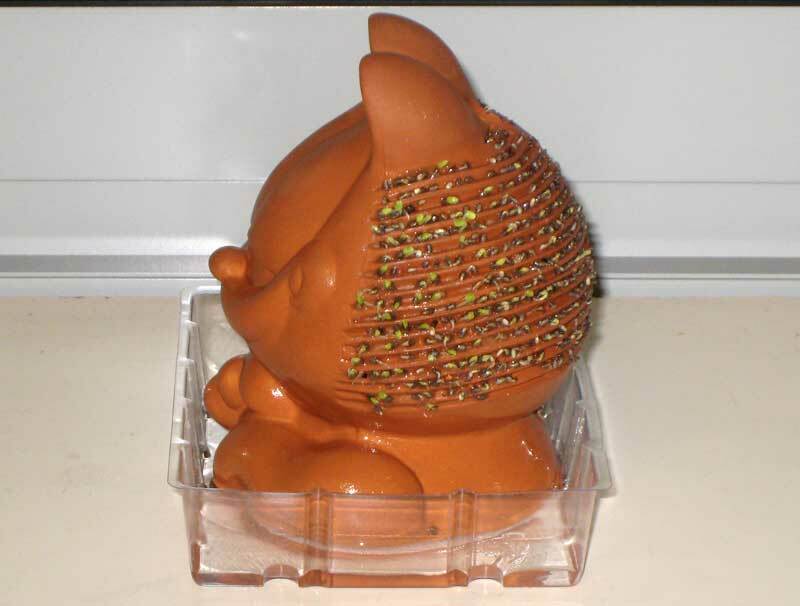 The instructions advise to soak both the Chia Pet and the chia seeds for 24 hours, then apply the seeds to the Chia Pet. 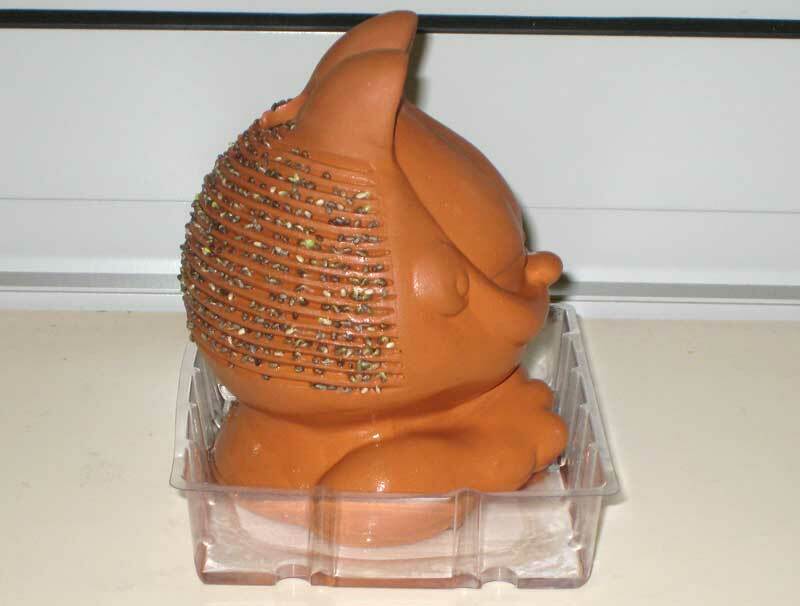 During the soaking, the seeds formed a gelatinous paste and this paste helped the seeds adhere to the pottery. 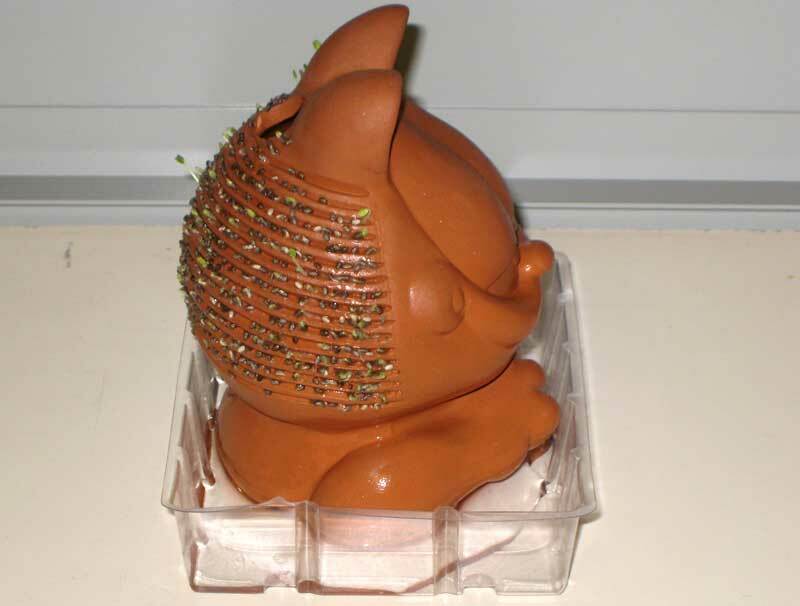 Below, the chia seeds have been applied to the Chia Pet. 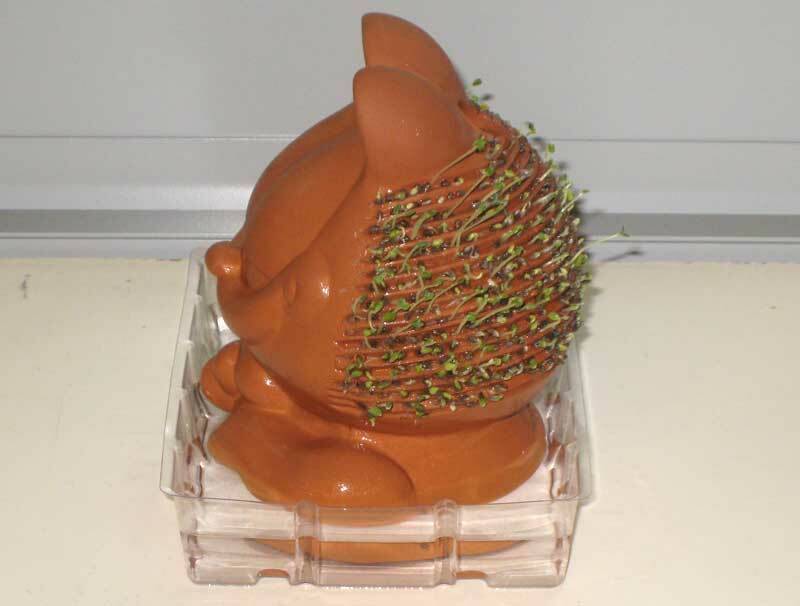 I was out sick (so no photos), but my office mates refilled the Chia Pet and noted that there wasn’t any obvious activity. 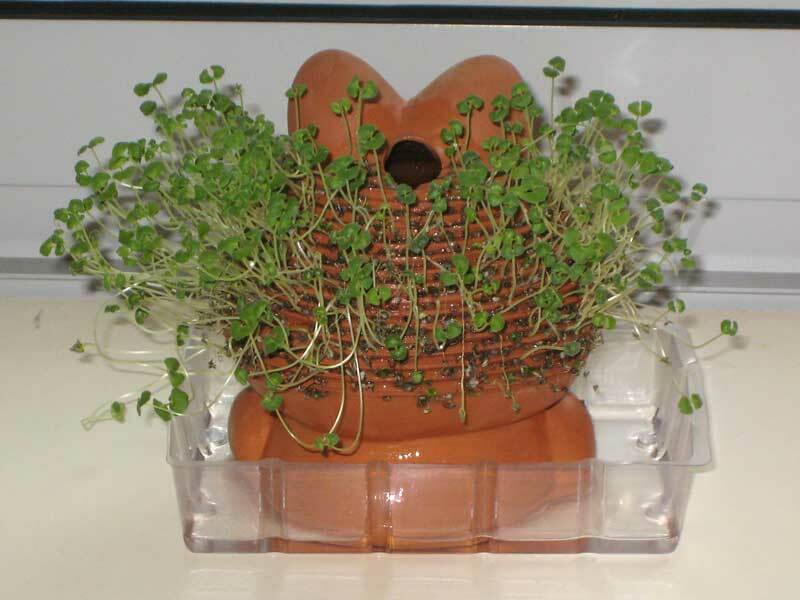 They remarked that it was very dry and that the drip tray was filled with water. 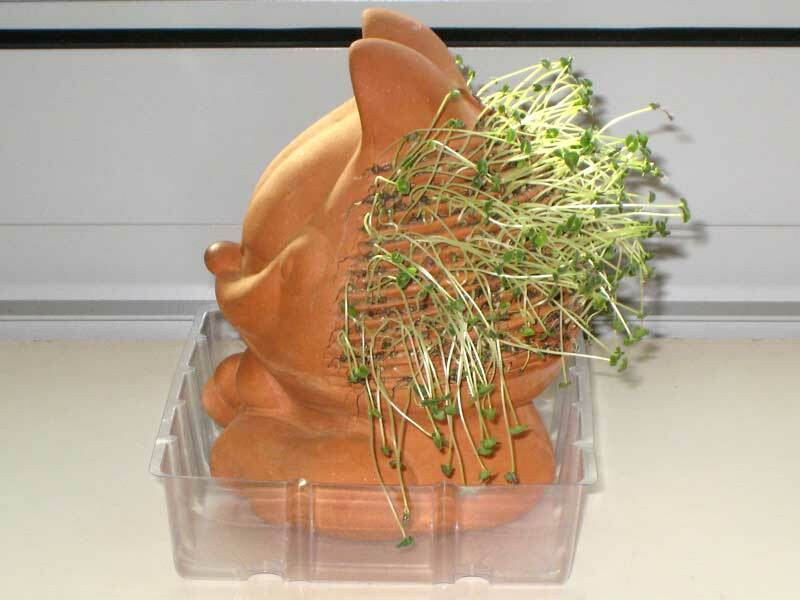 Growth! 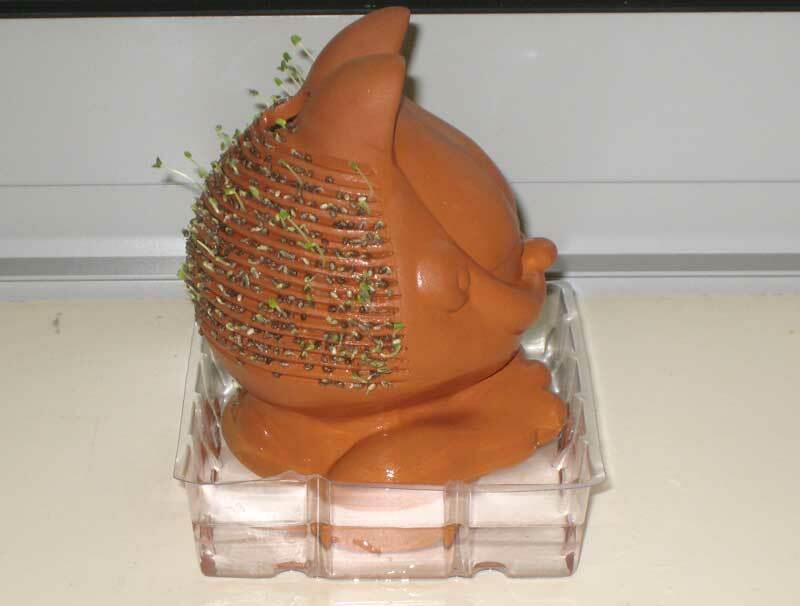 One week in, and many of the seeds on the right side of the Chia Pet have started to sprout, as expected by the availability of sunlight mentioned above. 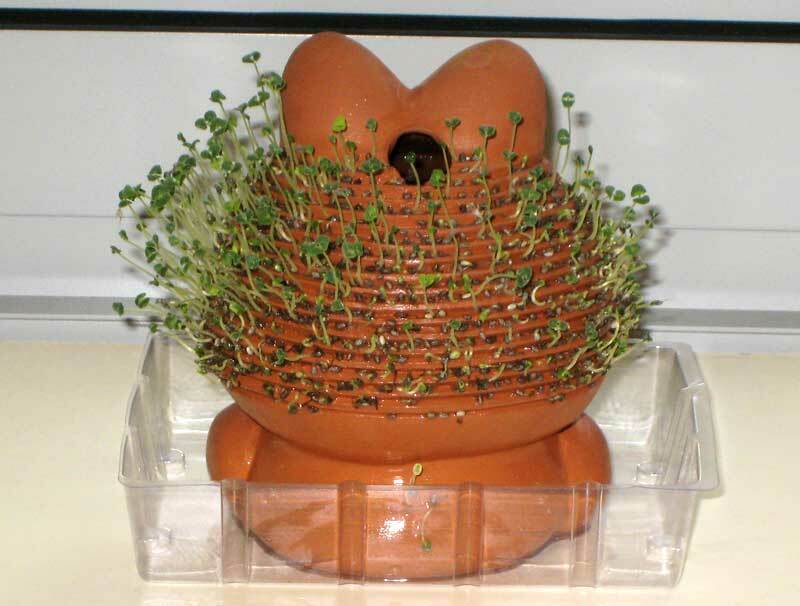 Two weeks in, and most of the growth is on the right side, as expected. 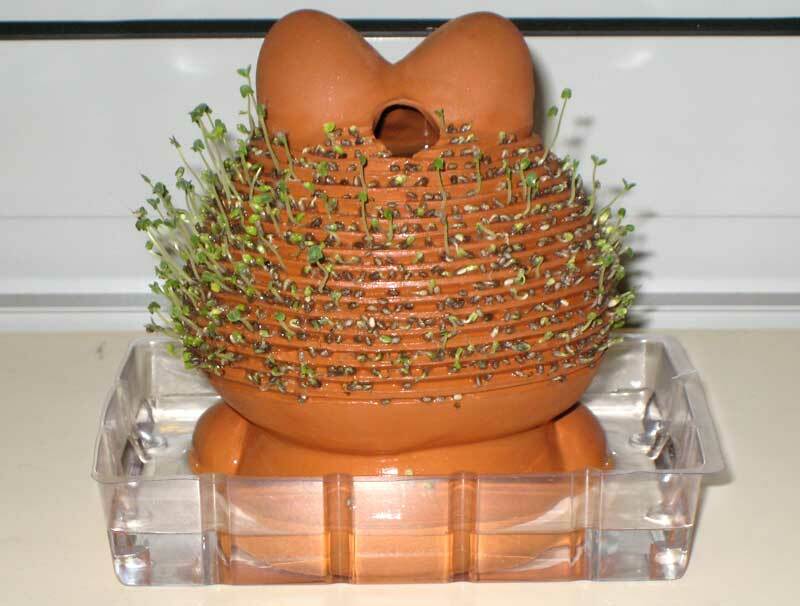 Interestingly, there is more growth on the left side then on the back. 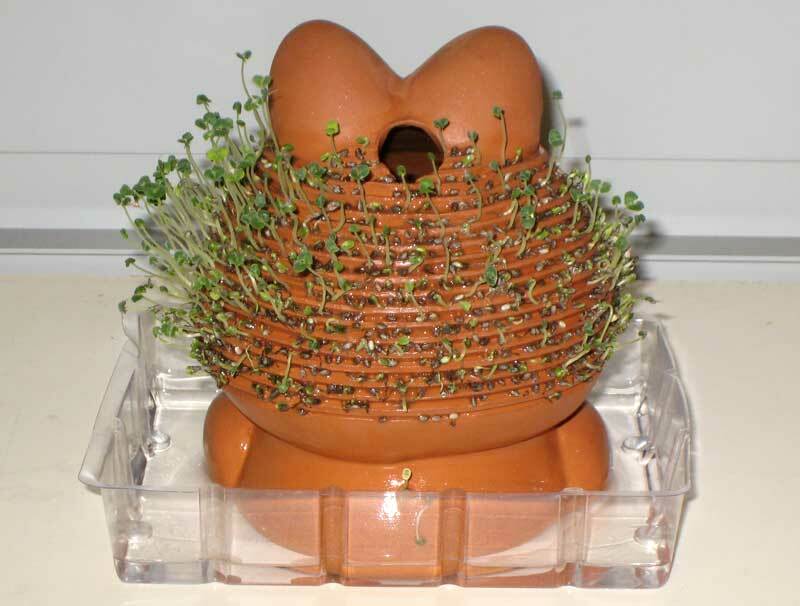 This may be due to the fact that the window hardware is fairly high, a little higher than the Chia Pet itself, which may prevent enough sunlight from hitting those seeds on the rear. 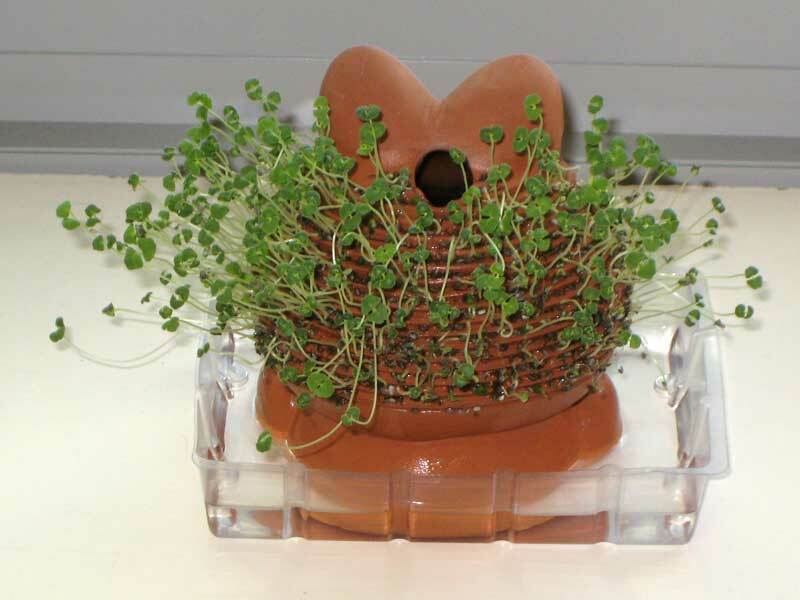 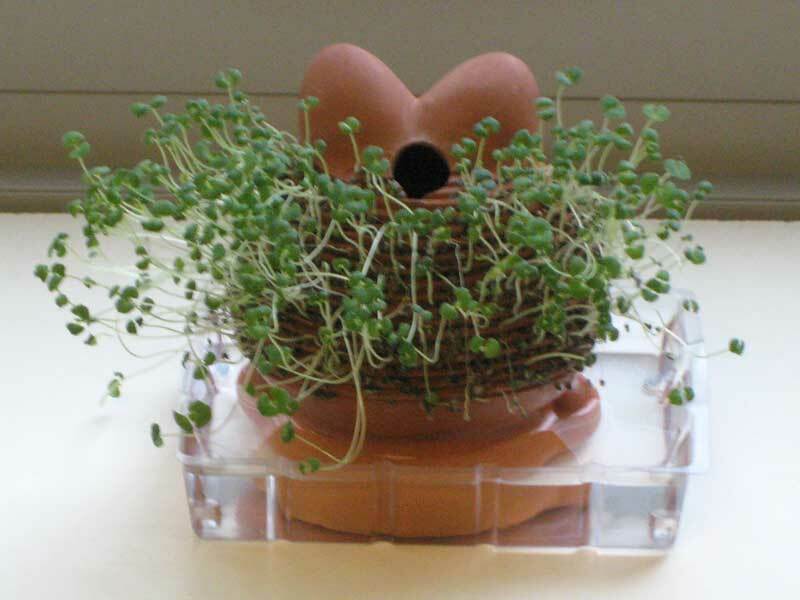 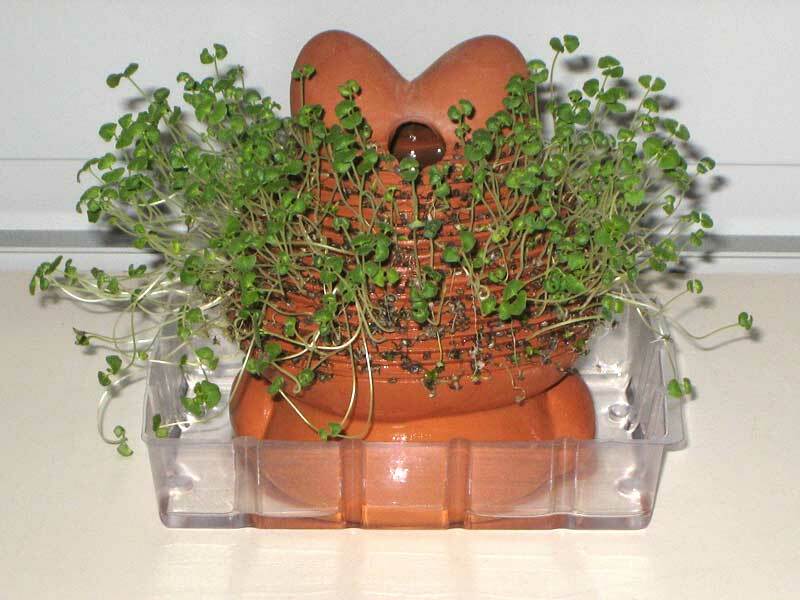 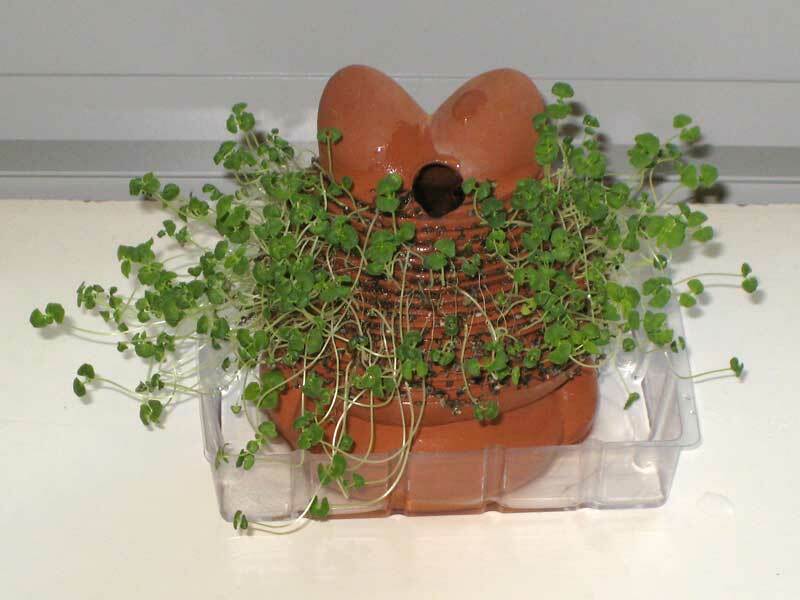 A future office planting may place the Chia Pet higher. 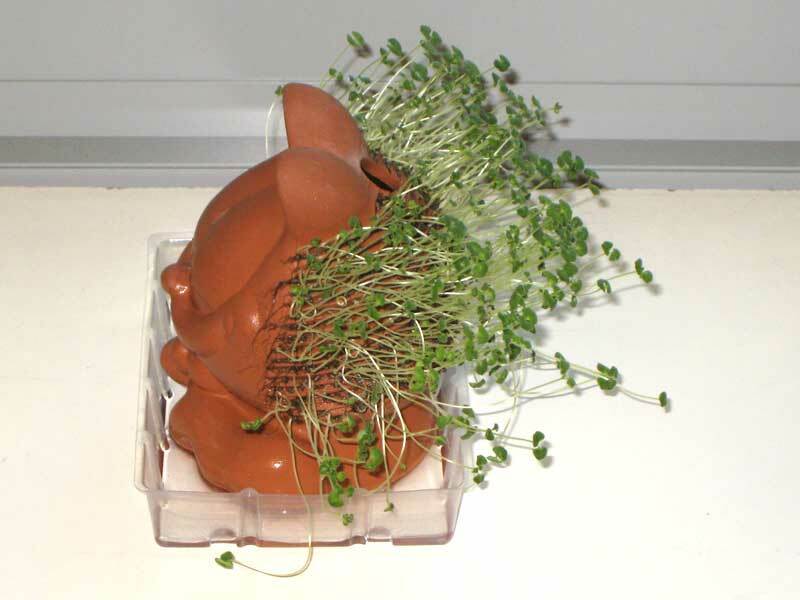 Due to Martin Luther King Jr.’s Birthday, our office was closed on Monday, which meant that the Chia Pet went three days without water. 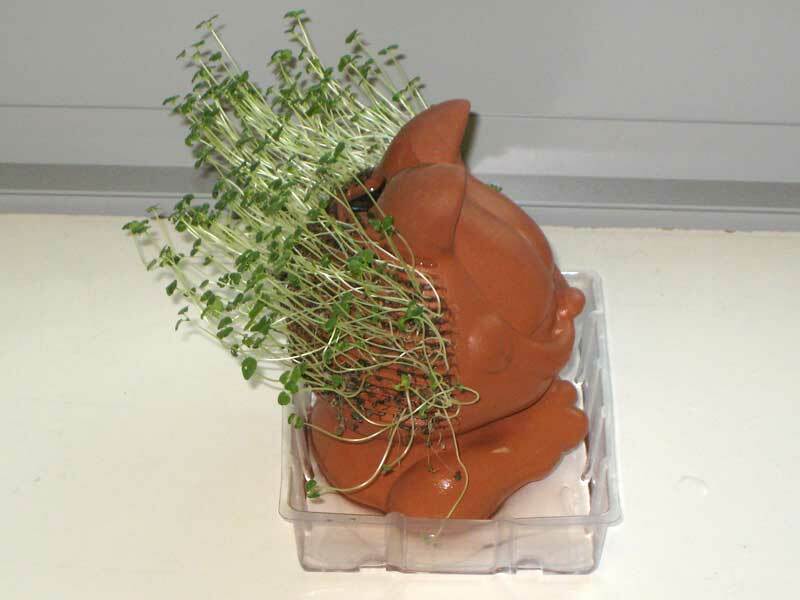 When I arrived to work on Tuesday, it was bone dry. 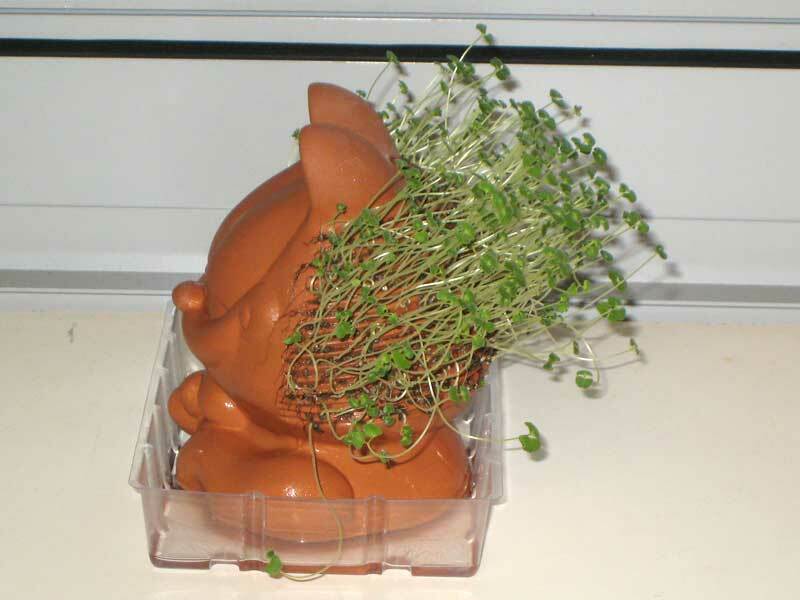 Most of the chia sprouts had wilted. 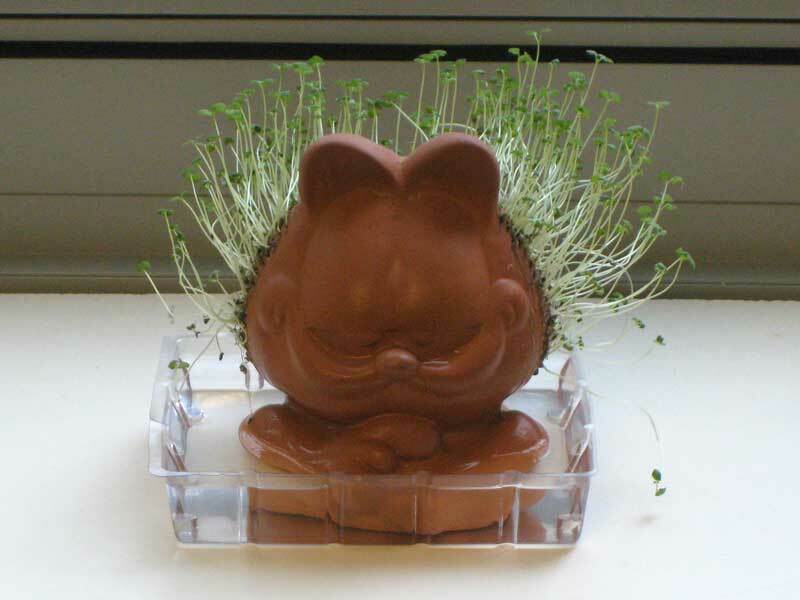 I immediately watered the Chia Pet. 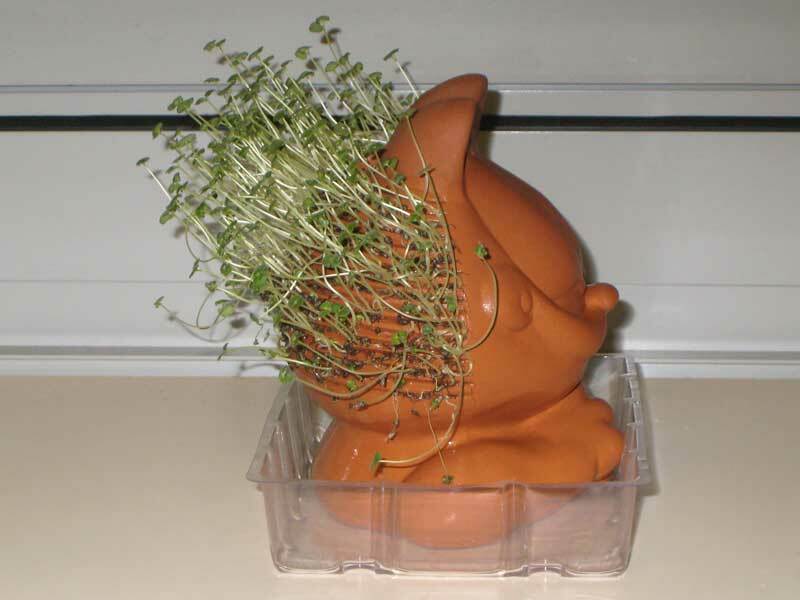 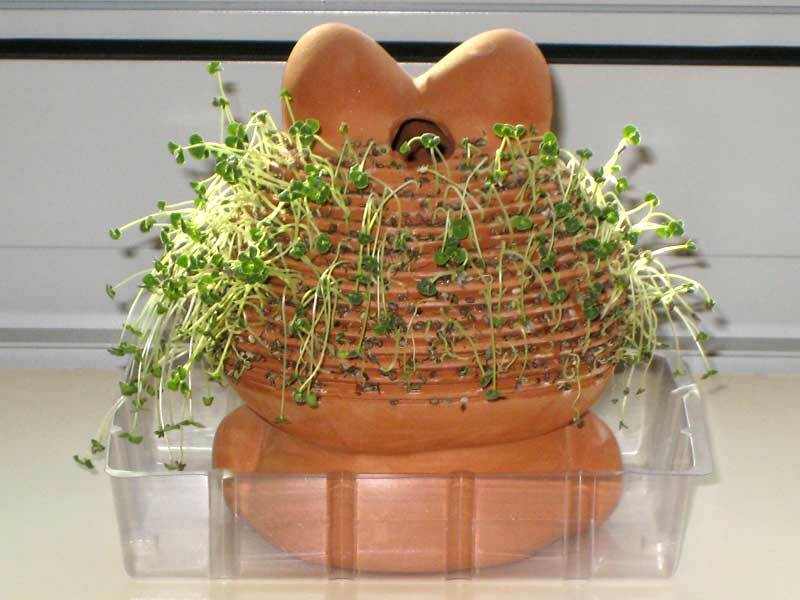 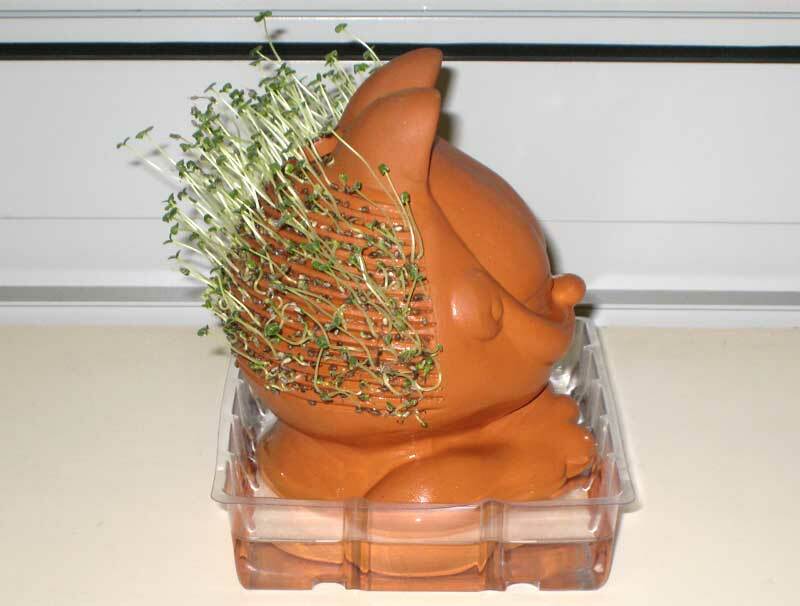 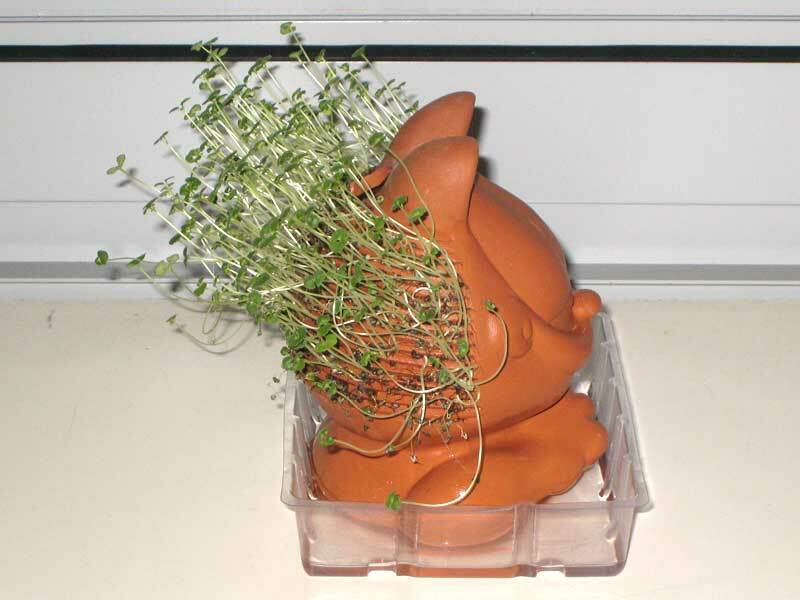 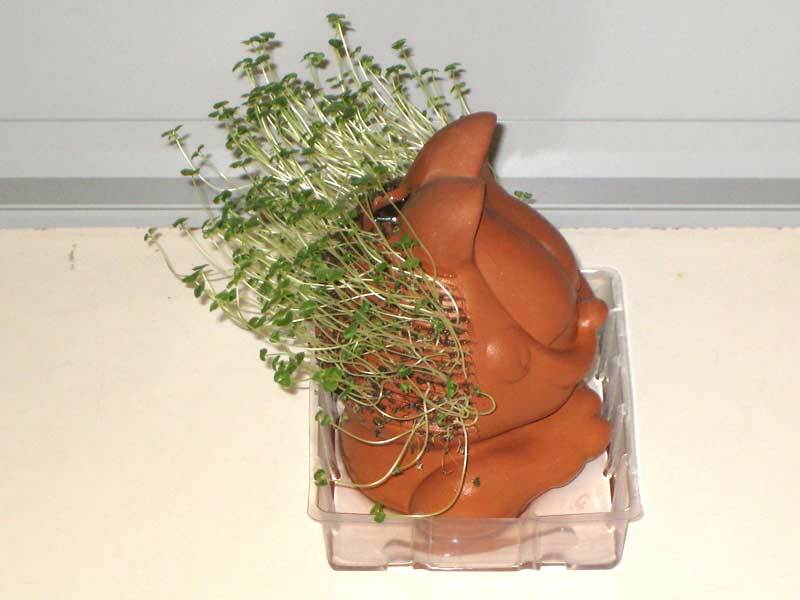 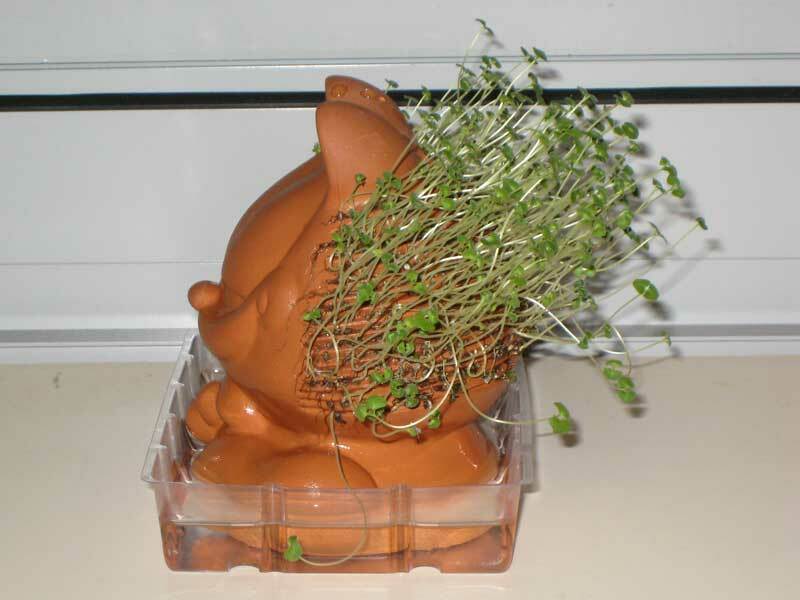 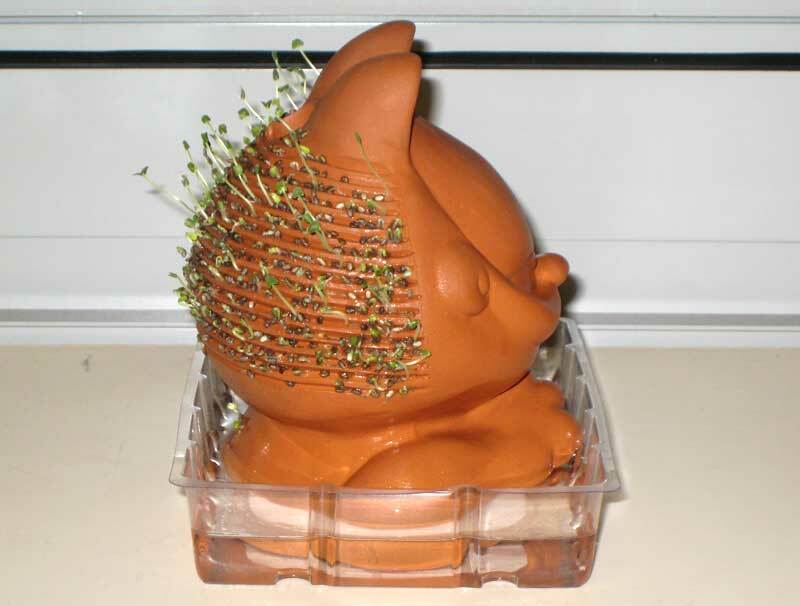 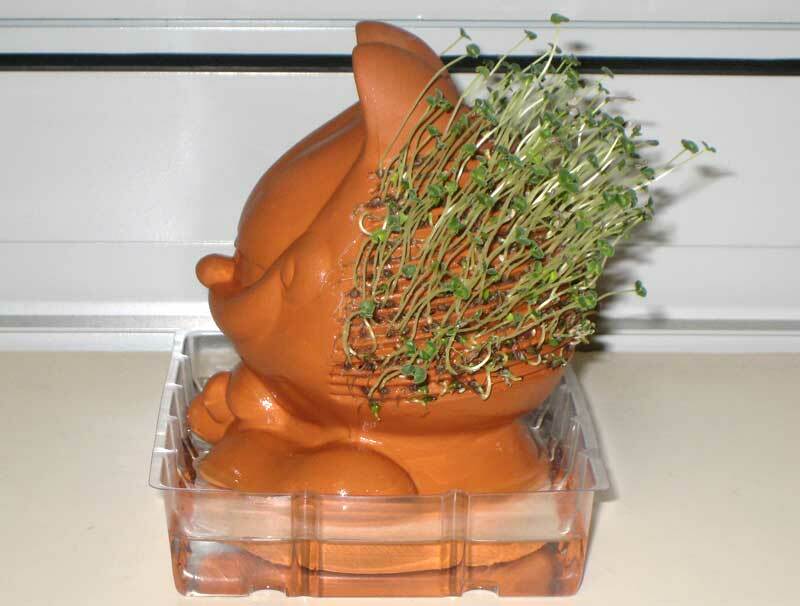 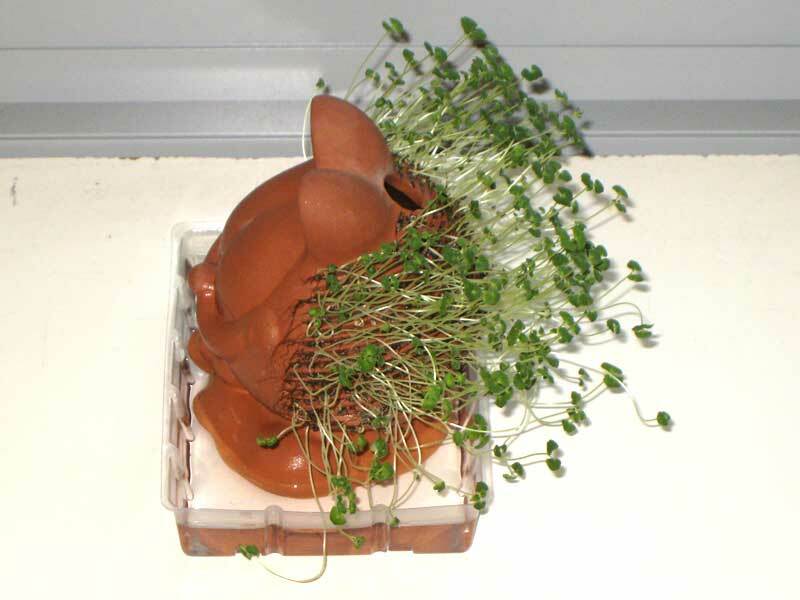 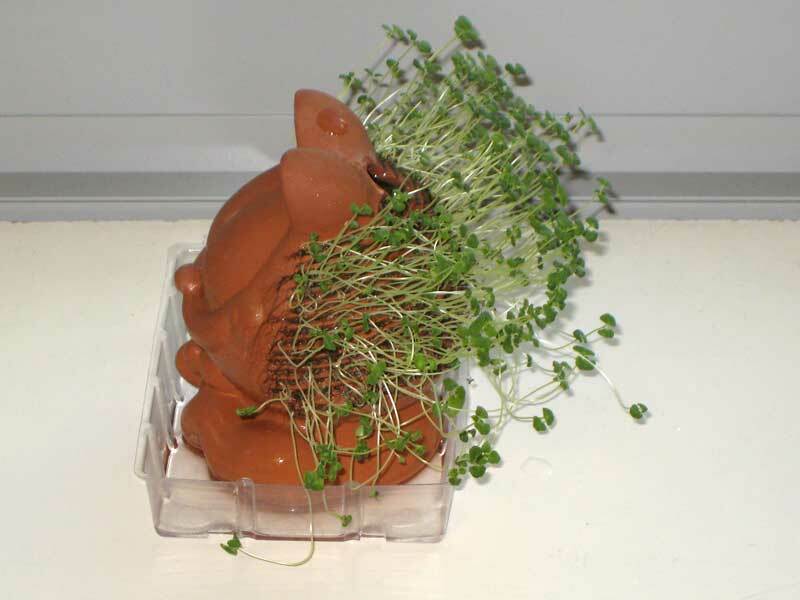 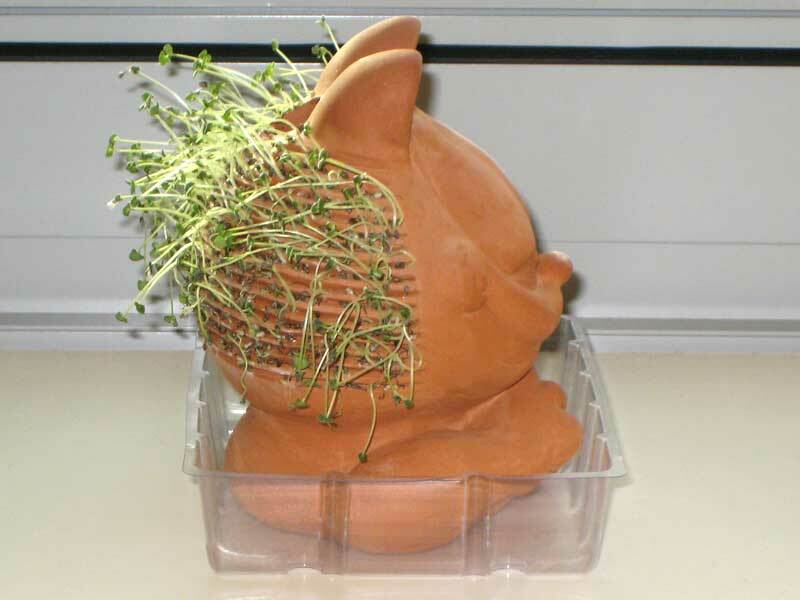 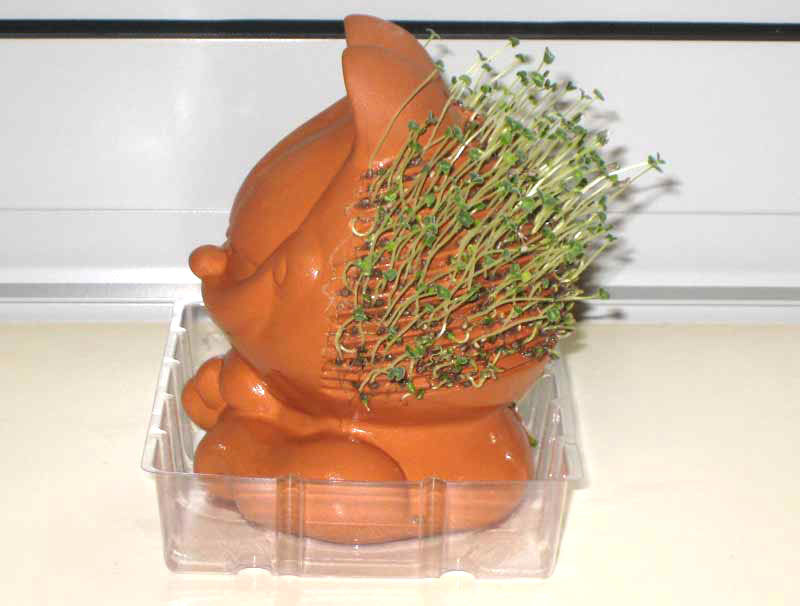 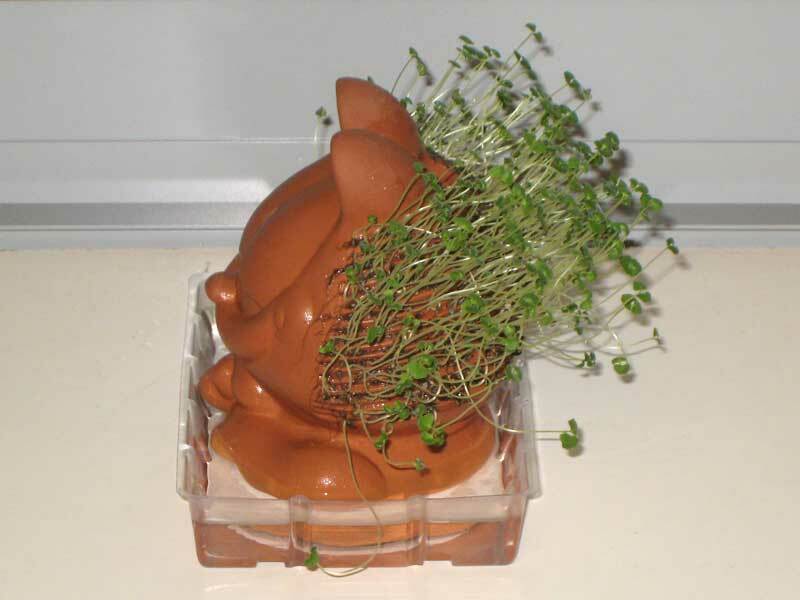 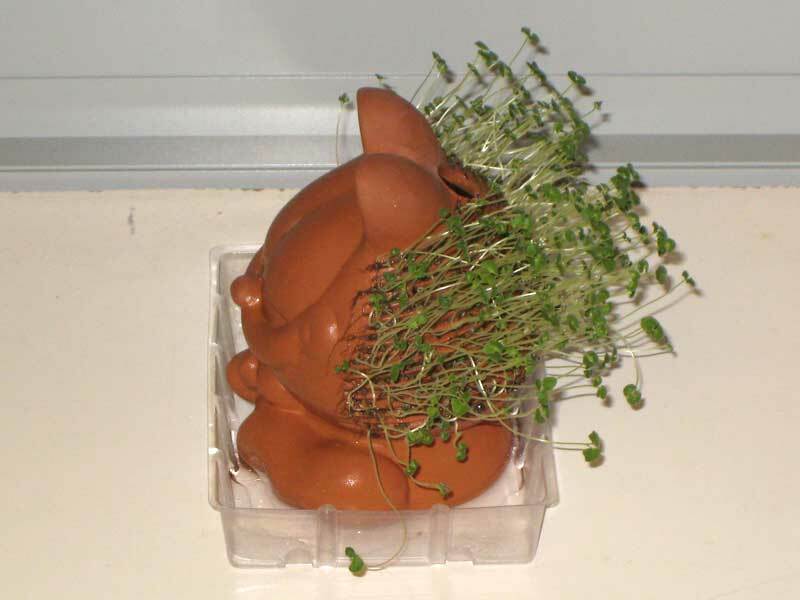 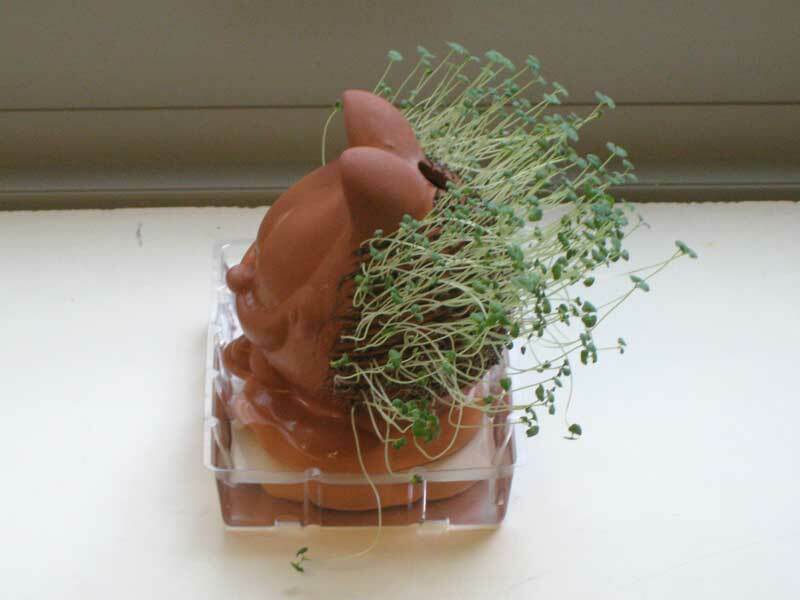 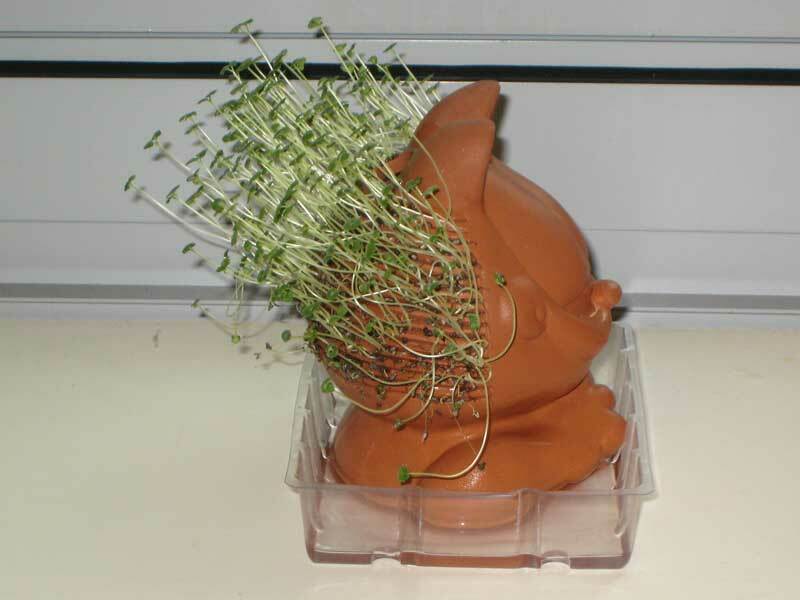 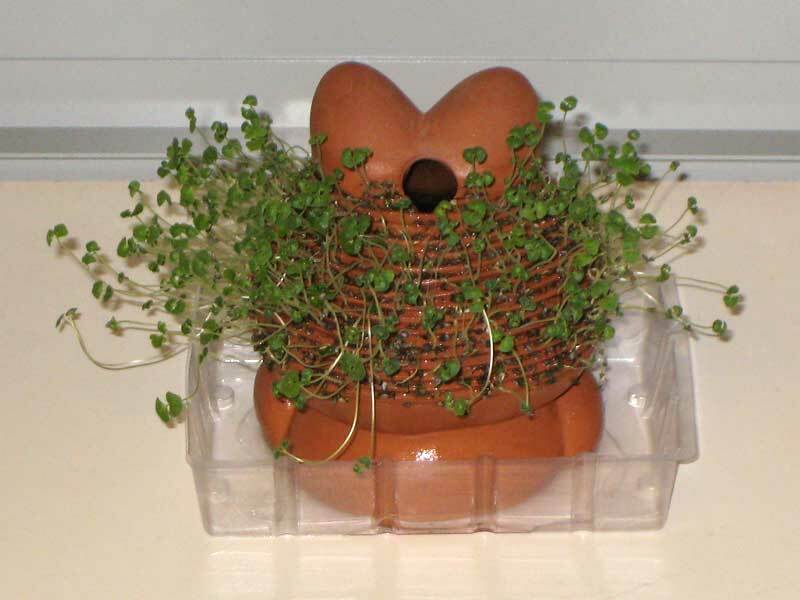 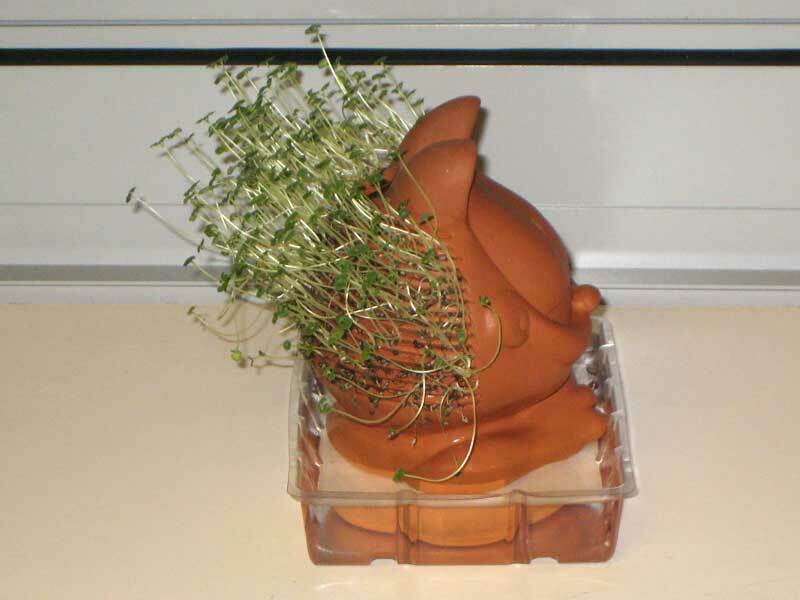 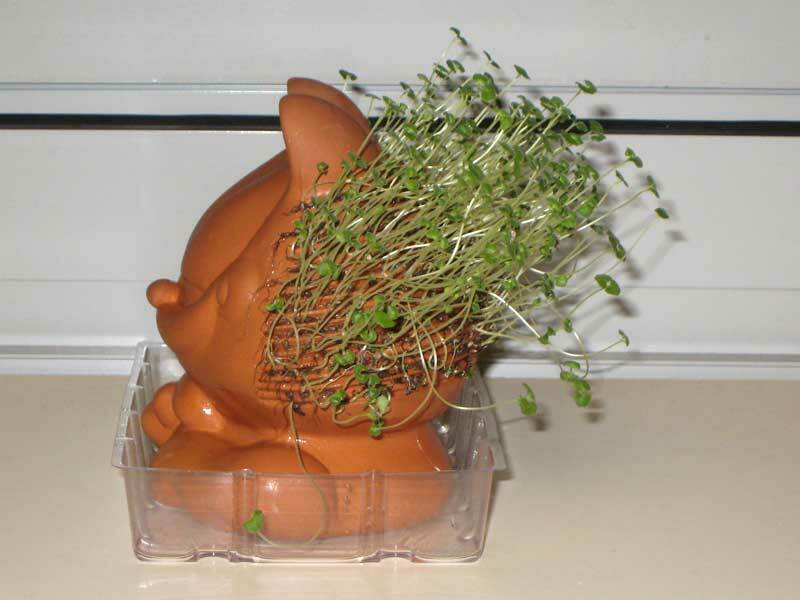 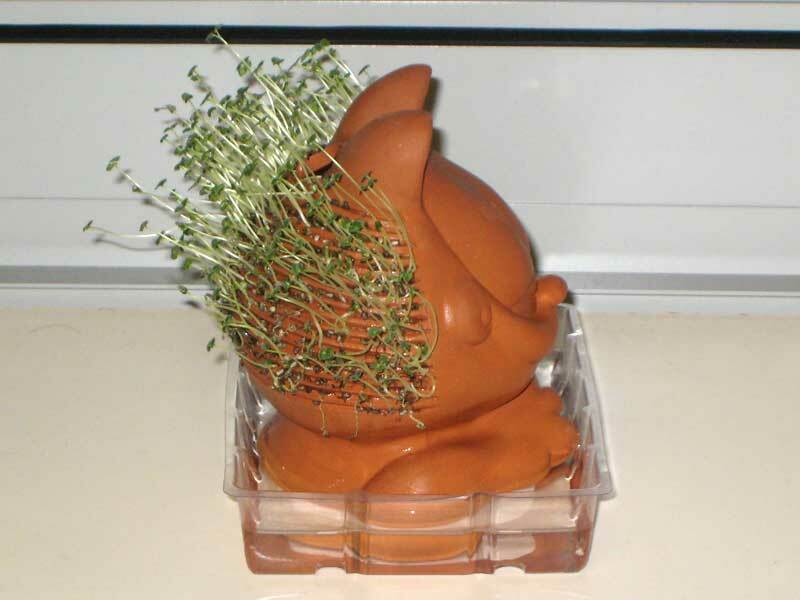 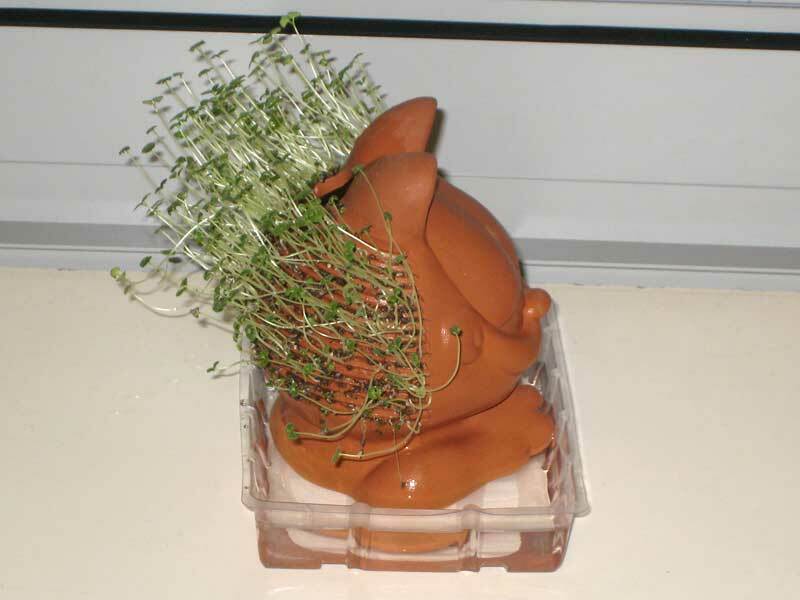 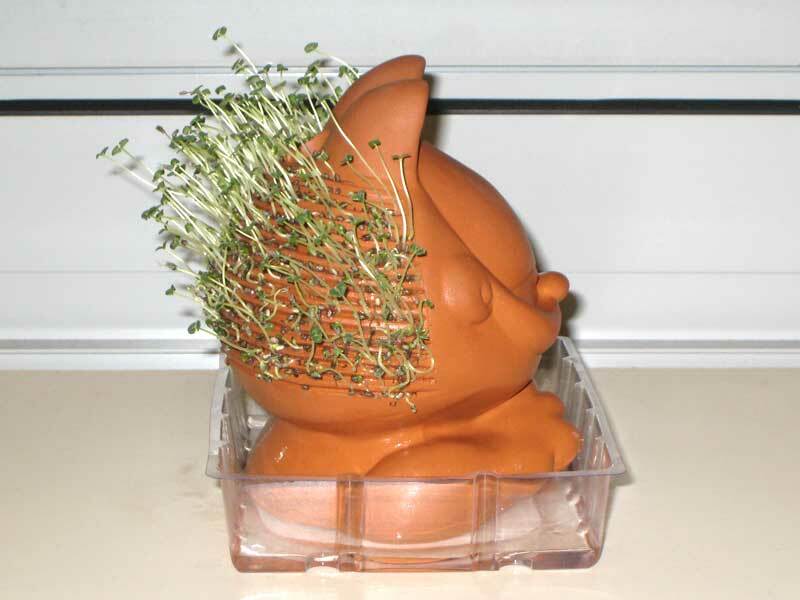 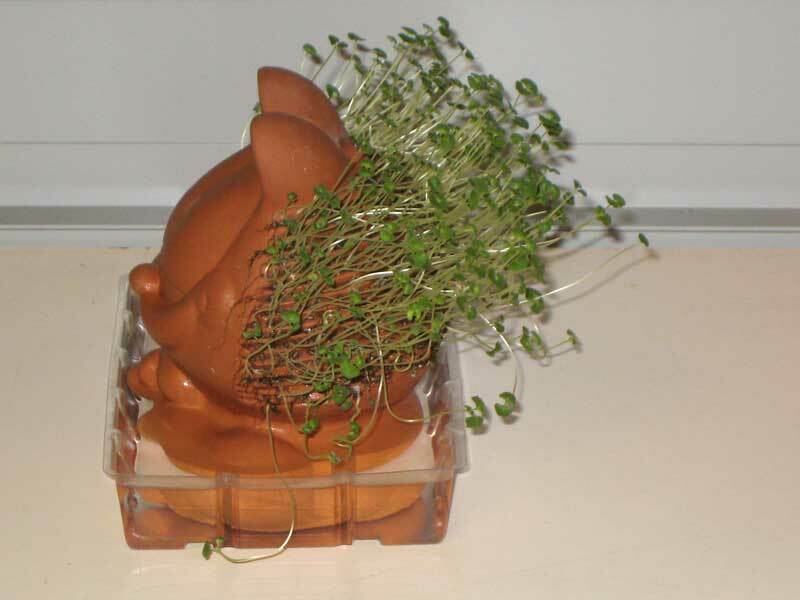 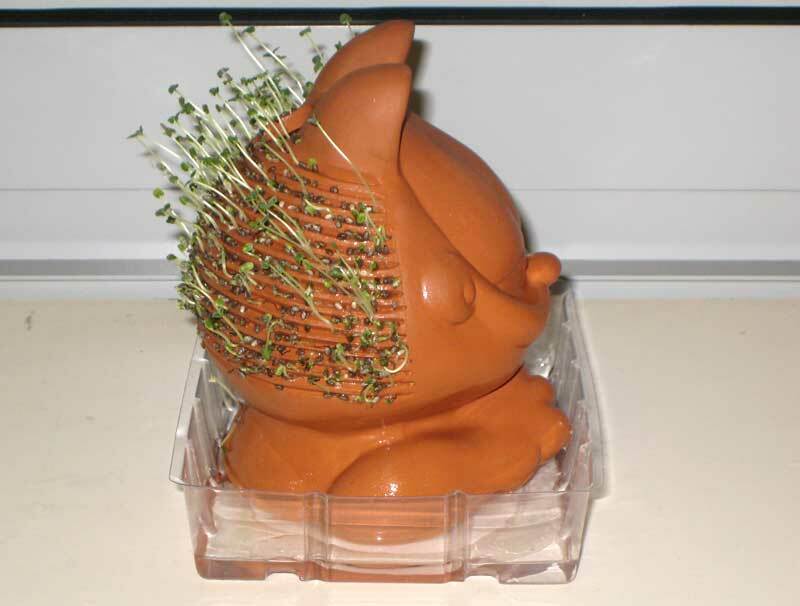 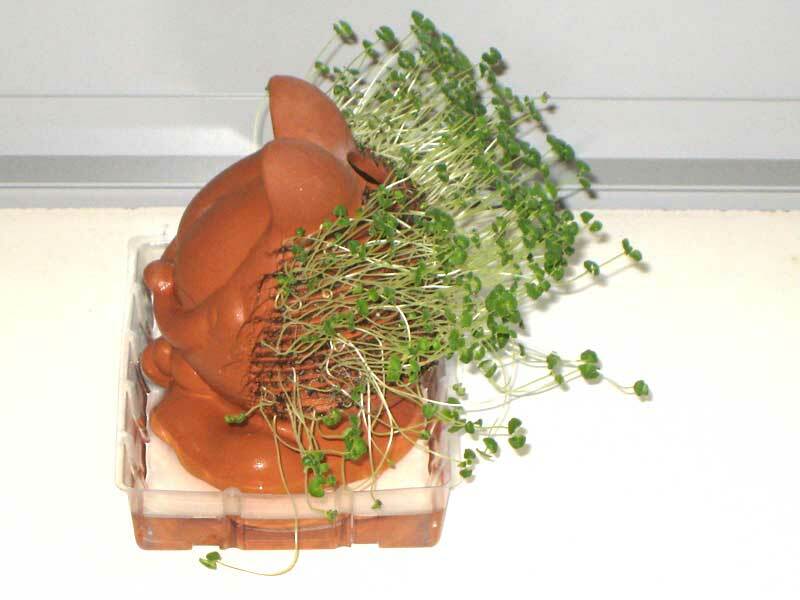 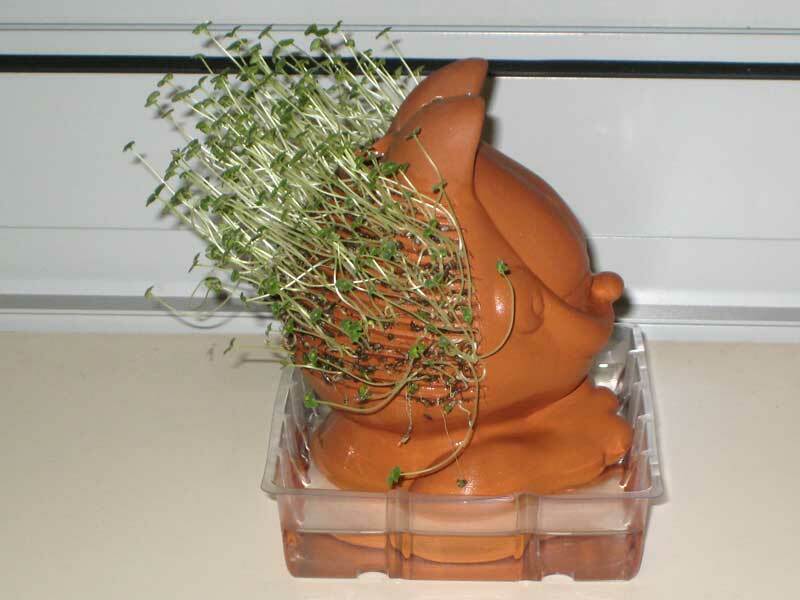 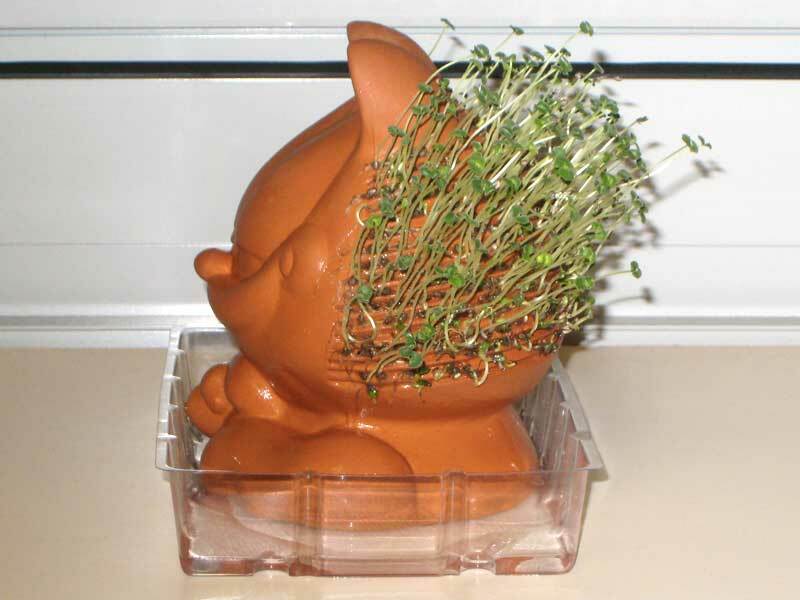 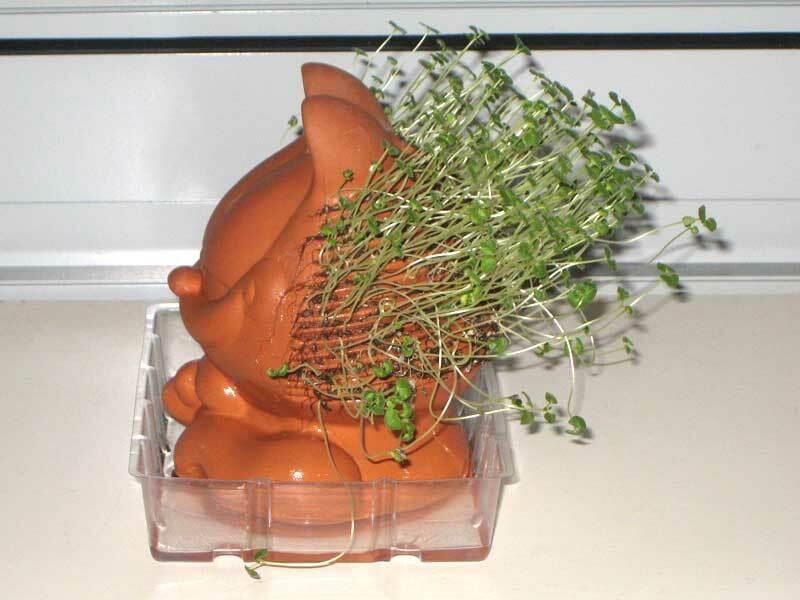 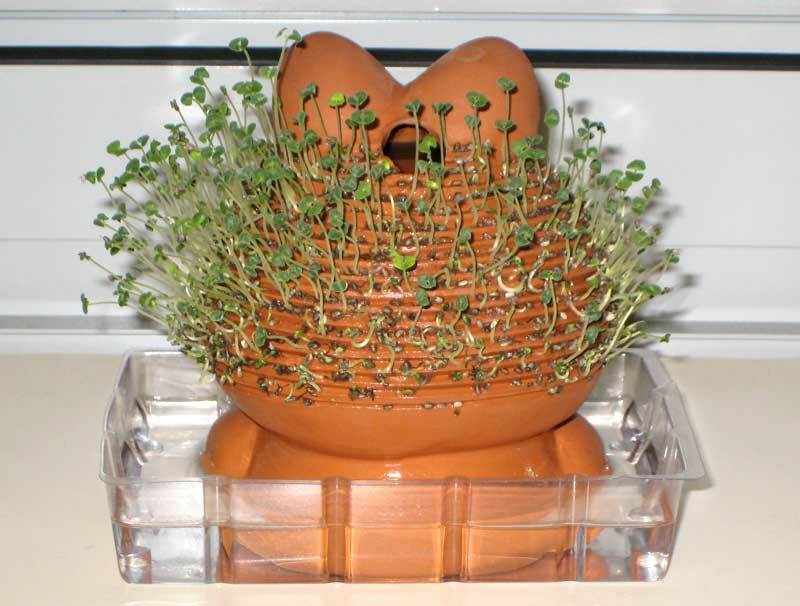 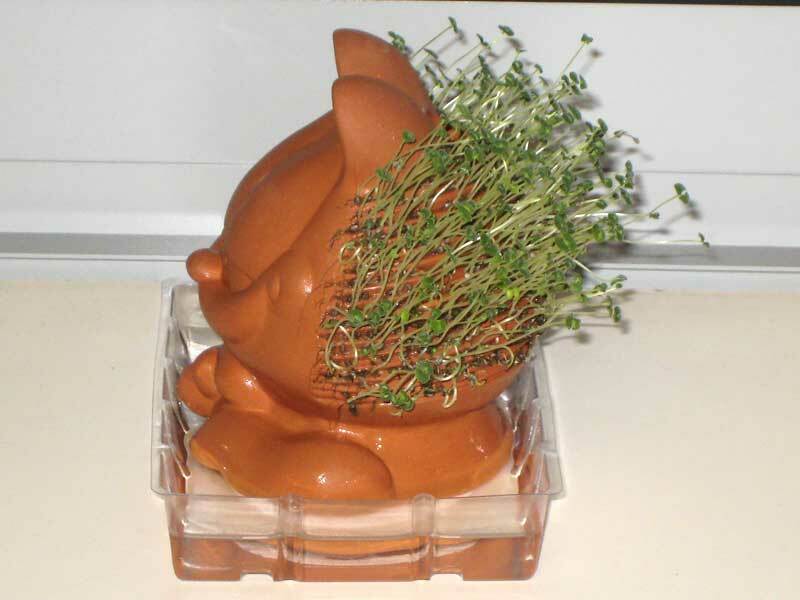 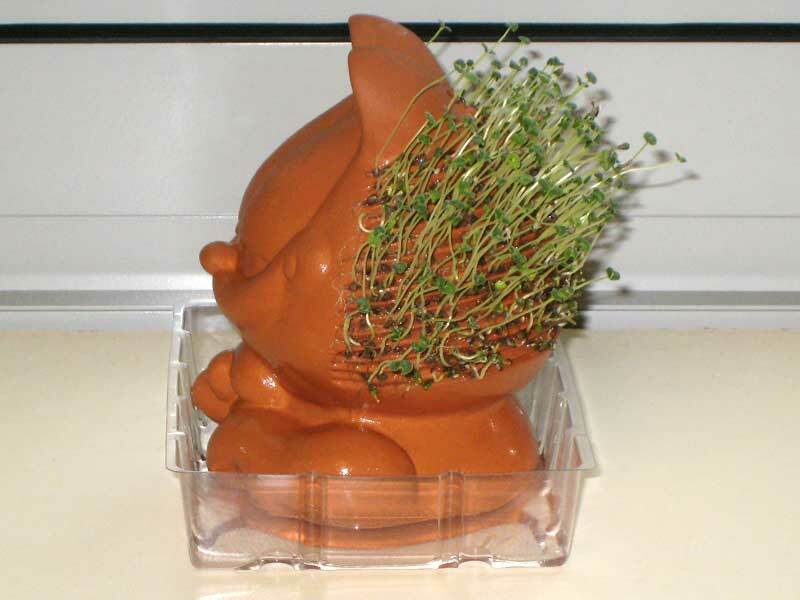 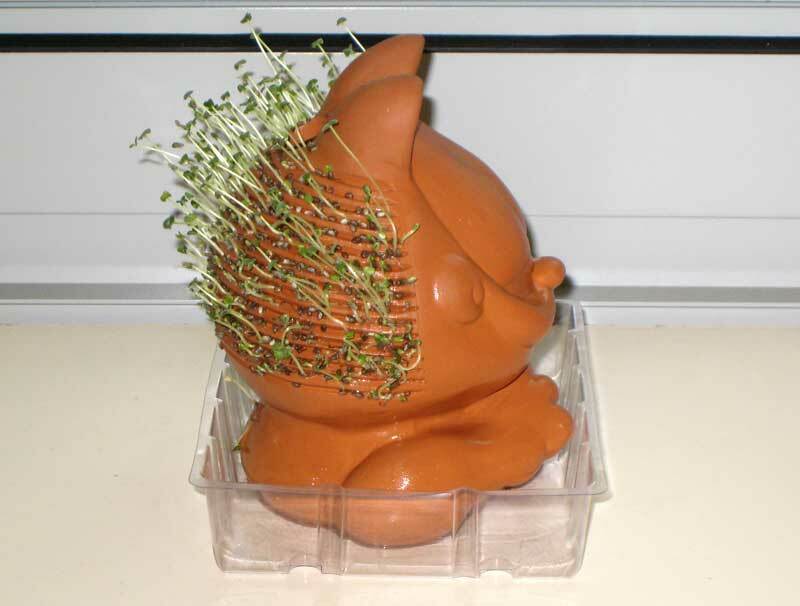 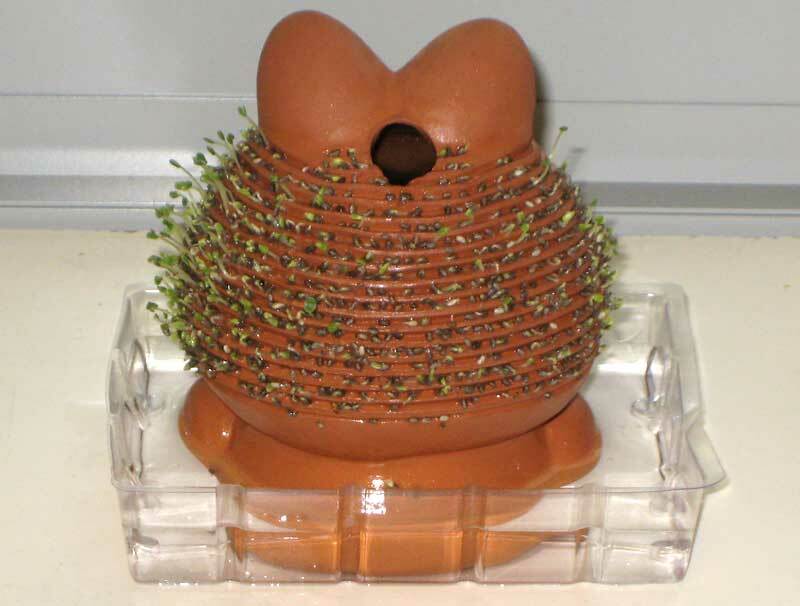 Later in the afternoon, the Chia Pet was moist and many of the chia sprouts had perked up. 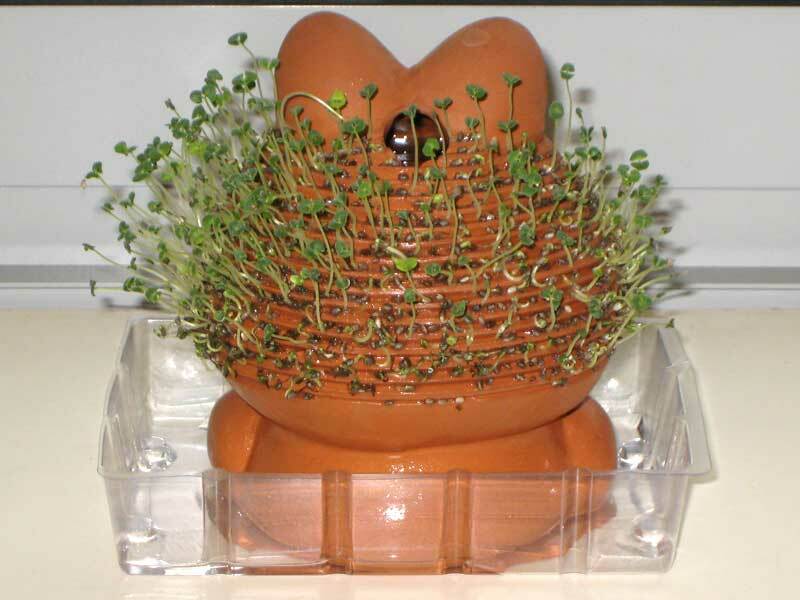 Most of the chia sprouts have recovered from the lack of water from the weekend. 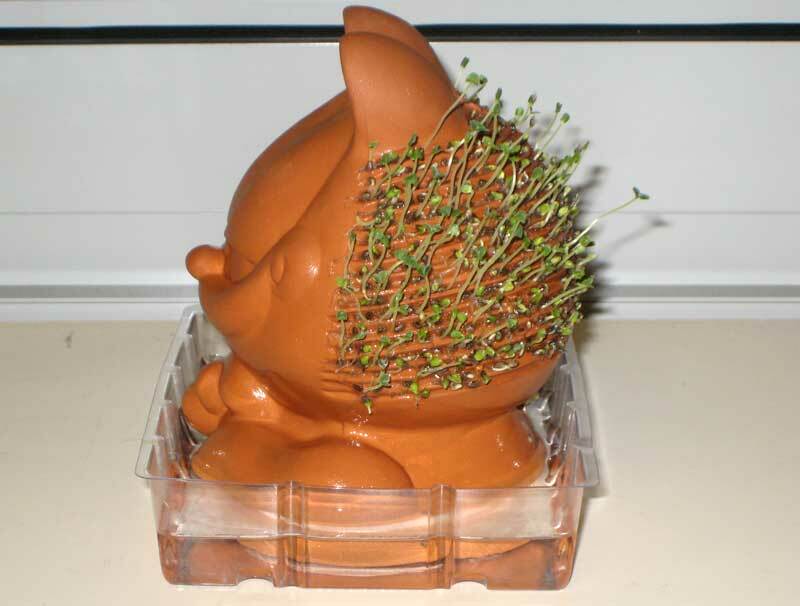 I was out sick today, so no photos. 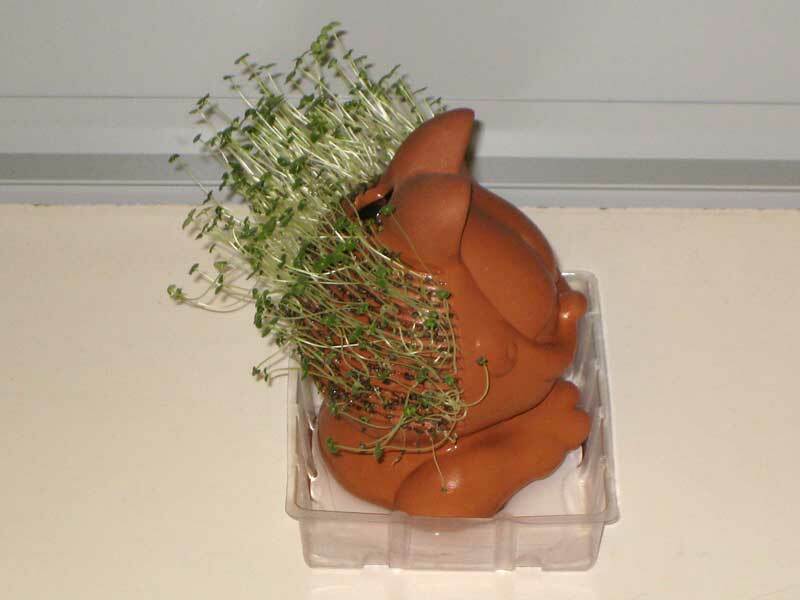 Co-workers watered the Chia Pet. 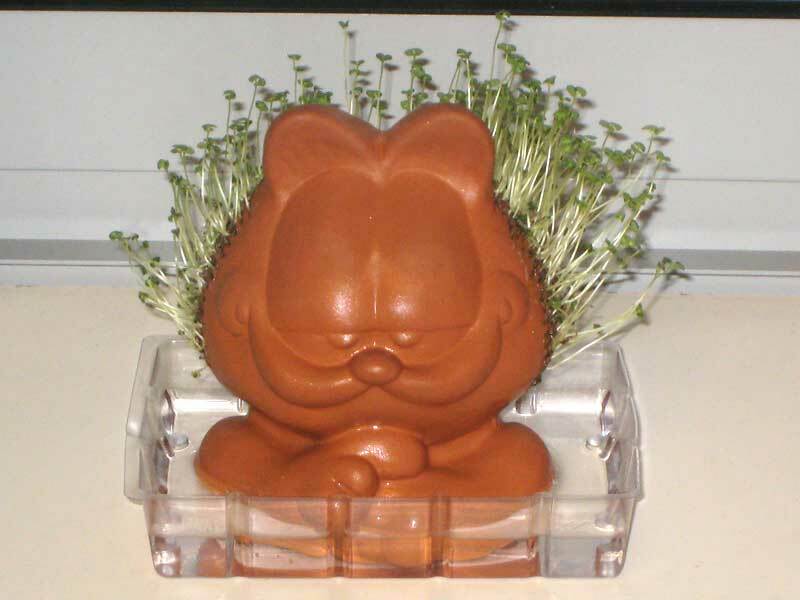 I forgot my camera at home, so no photos. 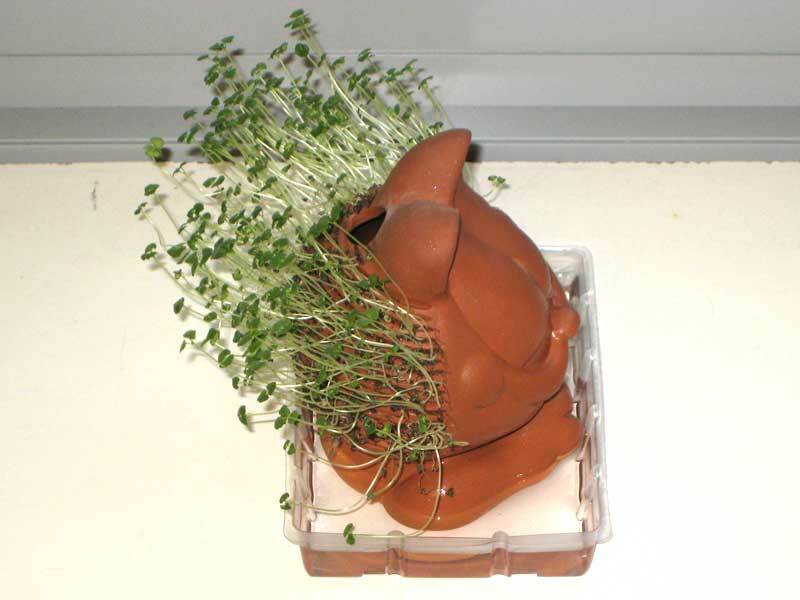 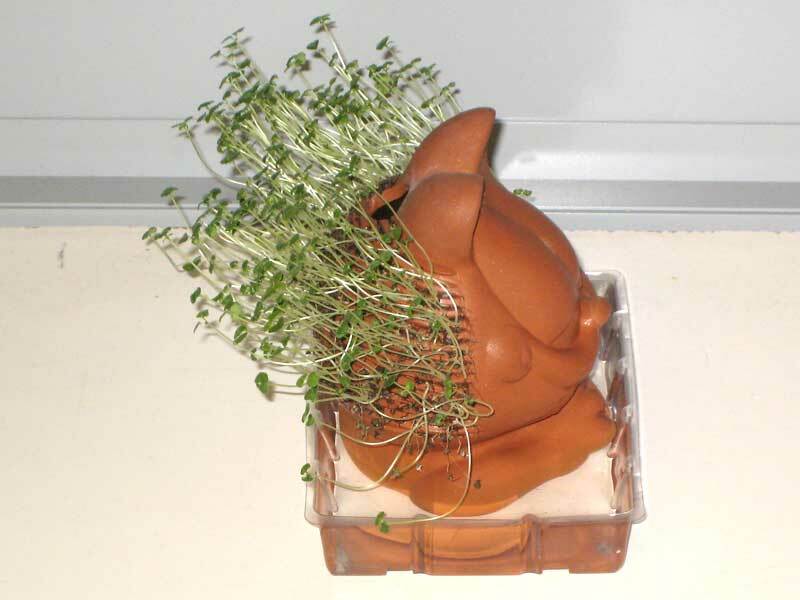 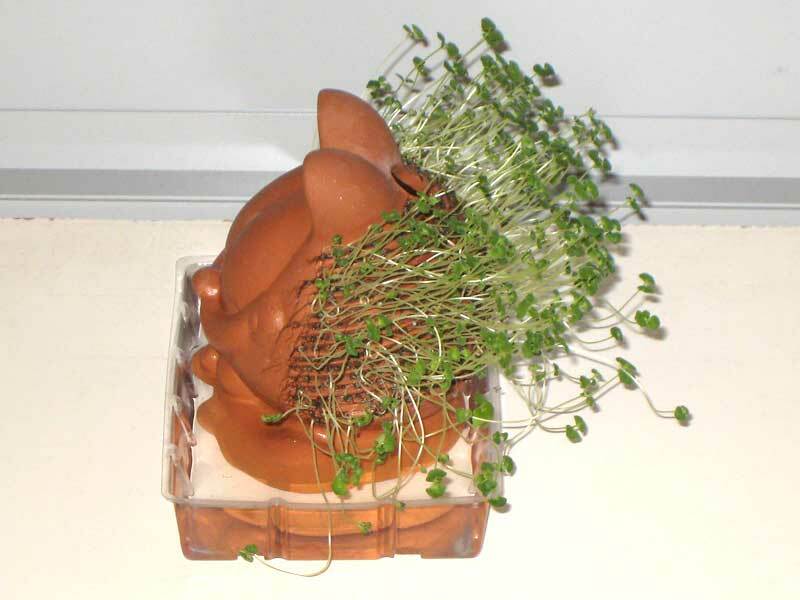 The Chia Pet doesn’t look much different from the last photos on January 21. 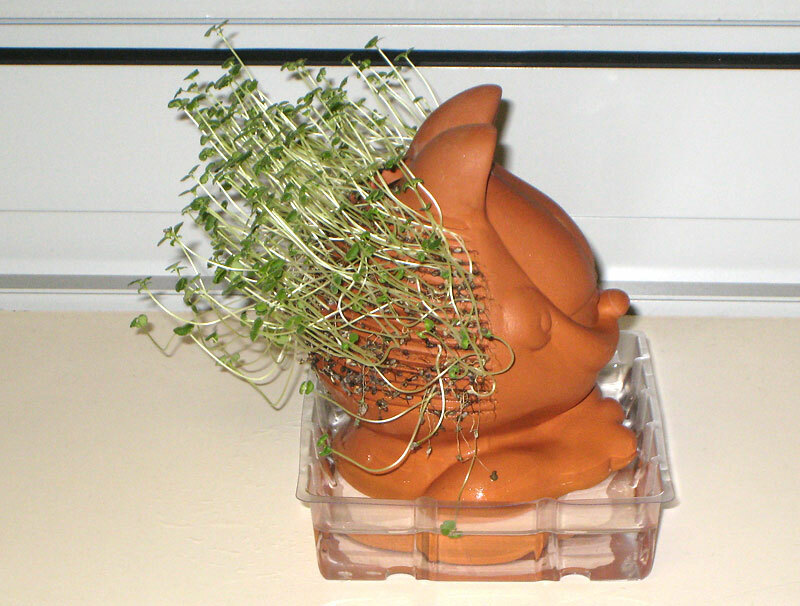 Most of the chia sprouts that had wilted from the long weekend had perked up. 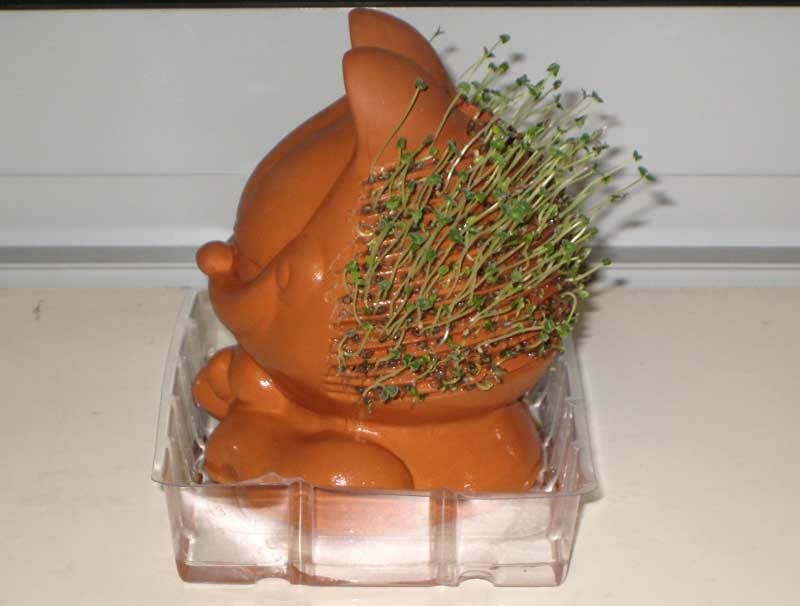 I forgot my camera at home, so no photos. 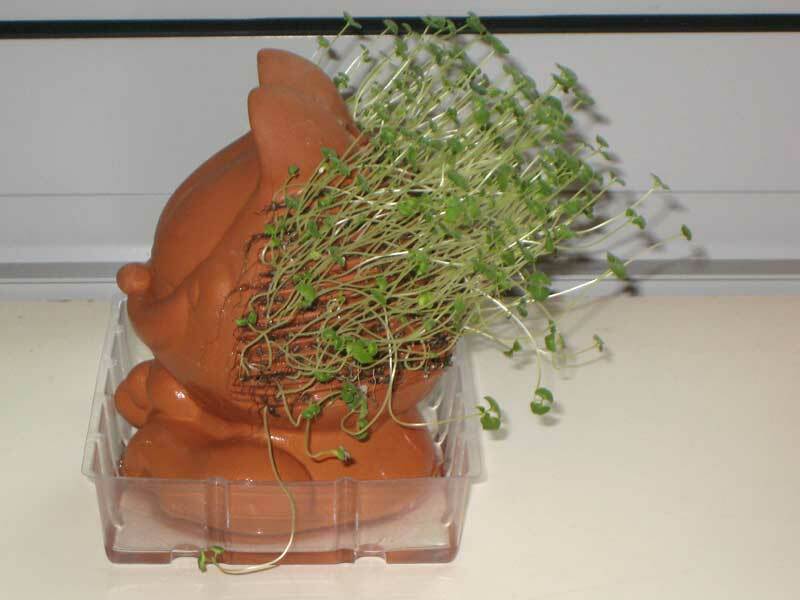 The Chia Pet doesn’t look much different from yesterday’s photos. 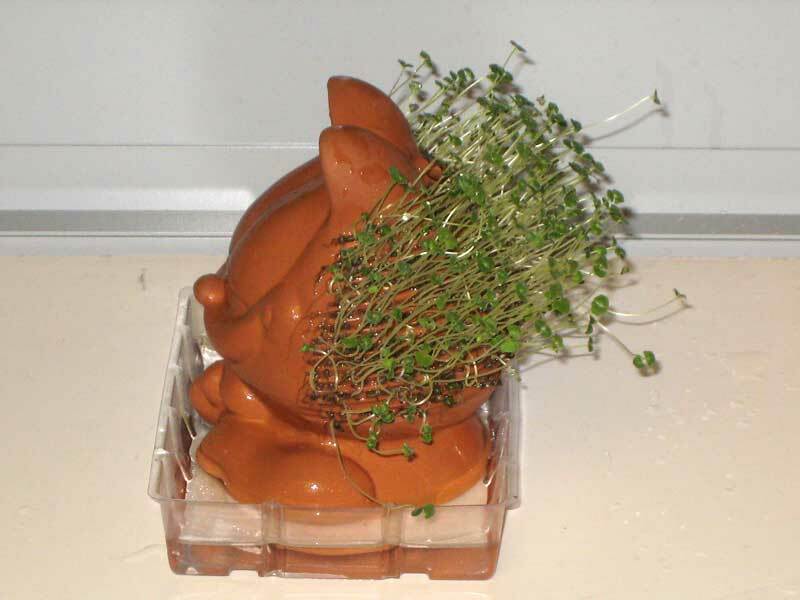 Sorry about the pictures. 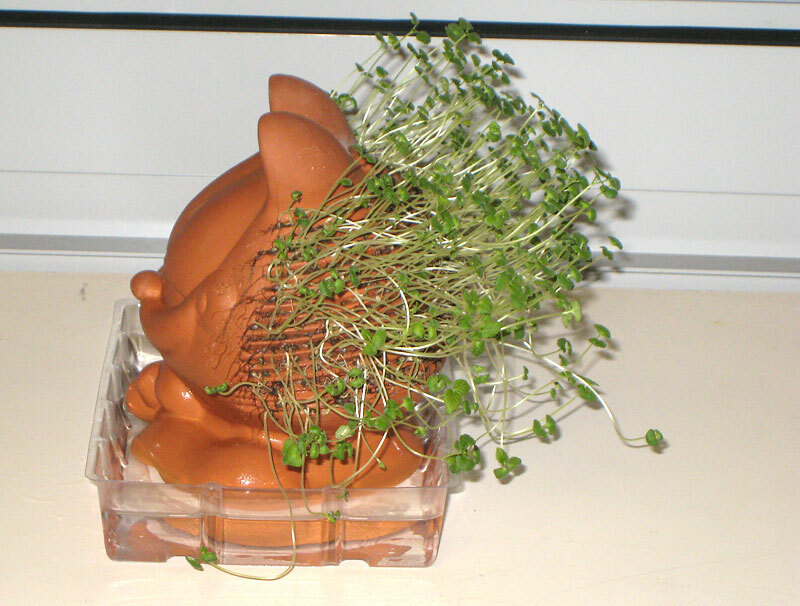 I didn’t notice that the flash was turned off, so these are a little on the blurry side due to camera shake. 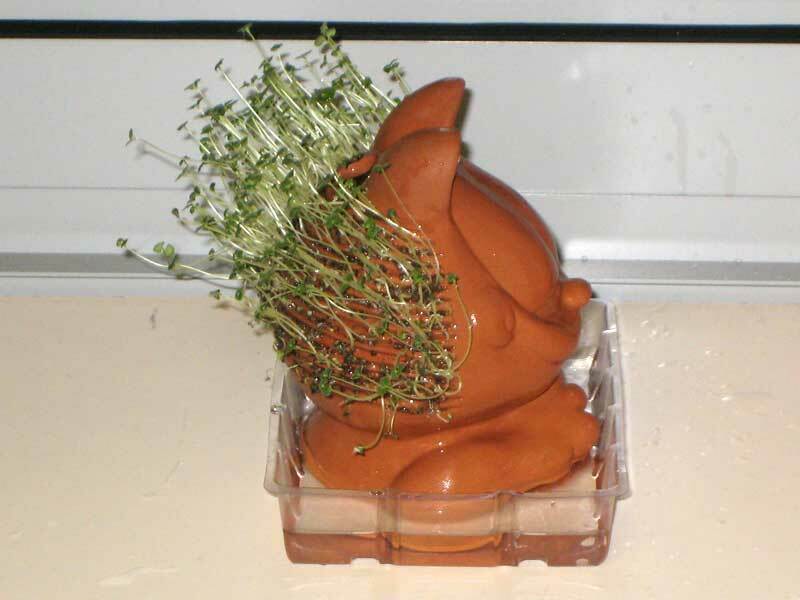 Since Victor suggested a Chia webcam in the comments below, I decided to take a 60 second video of the Chia Pet in action. 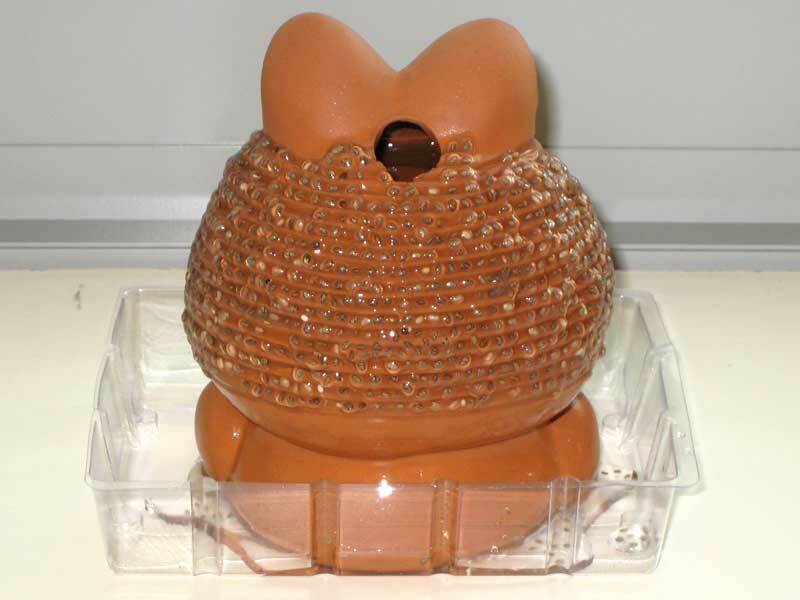 I think the most exciting thing about this video is seeing how steady I can hold the camera for 60 seconds. 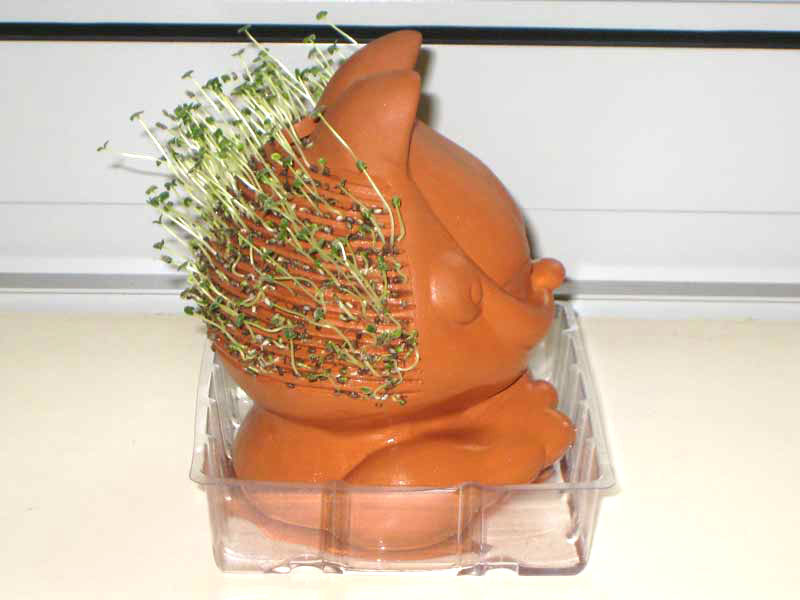 Even though I used a Canon SD800 IS (IS = Image Stabalization), the IS doesn’t function in movie mode.